FreedomPop Global GSM sim review 2016 | Get free cellular data every month! note: FreedomPop has THREE different services. It's important to understand the difference between the three services so you don't order the wrong phone, hotspot, or sim card. (#1) FreedomPop has been selling smartphones and hotspots with free Sprint LTE data since 2013. (#2) FreedomPop started selling a GLOBAL GSM sim (and hotspots) in 2016. And (#3) FreedomPop just started selling a new LTE GSM sim (and hotspots). All three services have a free monthly plan which includes 200 voice minutes and 500 texts, but the amount of free data is different. The (#1) Sprint-based services have a free plan with 500mb of domestic Sprint LTE data. The (#2) Global sim service has a free plan with 200mb of "global" 3G+ data. The new (#3) LTE sim service has a free plan with 200mb of domestic AT&T LTE data. All three services allow you to get up to 500mb more free data every month by adding FreedomPop friends. I have used, tested, and reviewed all three services, and they each have their pros and cons. The key is to understand the differences between the three services so you can make sure you are ordering what you think you are ordering! October 5, 2018 - I received a couple of comments today that prompted me to check my two remaining FreedomPop Global sim accounts. I logged into each account, and got a message saying, "Order Status: Your order will ship in the next 5-7 days." This is obviously not correct, and I wasn't able to access any of my account tabs to check billing, usage, etc. I haven't used either Global sim in a while, so I put them in a spare phone and checked, and confirmed that they no longer work. Instead of working, I get a message that I needed to activate them. So it appears that at least for me, the FreedomPop Global sim has finally been deactivated (at least the free plan). I don't use them anymore anyway. I switched to the FreedomPop LTE sim free plan long ago. And actually, I just got a new UNREAL GSM sim today that I am going to test. I intend to switch one of my FreedomPop Global sim phone numbers over to my new UNREAL account, just to see if I can do it. I will then close both Global sim accounts. As a tip, if you are seeing the same "Order Status: Your order will ship in the next 5-7 days." message and want to access other pages on your account, you can get to the individual pages by entering the direct url, i.e. This should allow a person to verify there are no pending billing charges, and then they can close their account from the account status page. October 8, 2018 - I just closed my two remaining FreedomPop Global sim accounts. Before closing one of the Global accounts, I transferred the phone number from it that I really liked over to my new UNREAL Mobile account, which was surprisingly easy and also instant. The FreedomPop account online cancelling process is currently broken. The "CANCEL" button does not do anything when you click it. It used to work, and it is how I closed my other three Global sim accounts. Anyway, to close my Global sim accounts today I had to send a direct message to the FreedomPop Twitter support group (I explain how to in my FreedomPop Dummies Guide, and you'll need a twitter account, which is free to set up). I sent a direct message and said please cancel the two global account associated with my-email-address-1 and my-email-address-2. I received a reply in under 30 minutes that the accounts had been cancelled. I logged into them just to make sure, and they are closed. There is now a message saying: "You have not signed up for FreedomPop service yet. Already have a device? Activate here". So if you need to cancel your Global sim account(s), FreedomPop support via twitter is quick and easy. FreedomPop no longer sells the Global GSM sim. The Global sim is still working for service in Europe, per a comment below by a reader who was in Europe in September (2017), and also per another reader who was in London over the summer. Per my review below, it works well in some European countries, works ok in others, and does not work in a few. Also, the Global sim used to work here in the US for 3G+ service via roaming agreements with both TMobile and AT&T. The Global sim AT&T service has been discontinued and no longer works, and TMobile will be replacing it's 3G service with 4G/LTE, so TMobile support is being slowly phased out. I checked my Global sims here in Santa Barbara, California, and I still get 3G+ TMobile service, but I don't know for how long. FreedomPop is recommending that their Global sim customers should replace their Global sims with the new FreedomPop LTE sim. I have been using the newer LTE sims since January, and they provide very good AT&T LTE cellular data and are much better for service here in the US. If you want service in the US, you should consider the newer LTE sim. You can order the FreedomPop LTE sim for a penny here. Multiple people have reported receiving emails from FreedomPop stating that the Global sim will stop working on January 3, 2018. I currently have four working Global sims. I have not received this email yet, but I'm assuming is is correct. Maybe some Global sims will keep working after Jan 3, 2018? A FreedomPop admin posted the following message on the FreedomPop community forum about the global sim, "Some older SIMs will no longer work as our network partner changes carrier settings. Not all SIMs are impacted, but if you've received notice via email - then your SIM is amongst those impacted and will cease to operate on January 3rd, 2018." I've never received any emails, so apparently my Global sims will still work after January 3? As is typical with FreedomPop, I'm not really sure, but we will know more on January 4. FP Global sim still works in California and in Europe! I tested two of my FP Global sims on January 8, 2018, here in Southern California. Both still work. I was able to access the internet using cellular data, and I was also able to call and send texts with the FreedomPop app and FreedomPop phone number. I have read other people who are reporting that their Global sims still work after January 3 as well. I never received the email saying my global sim would stop working on January 3, and I don't know what happened to people who did receive that email. For now, my Global sims continue to work here in the US. In addition, a reader named Tony reported via his comment below that he just got back from a trip to Europe and the Global sim still works there as well. From his comment on January 18, 2018: "Just got back from a trip to Spain and the UK. SIM worked fine in both countries. I used it from 1/11/18 to 1/13/18 in Spain and 1/13/18 to 1/16/18 in the UK. I got the SIM last March (2017)." As for the future, in the US, FP Global sims no longer work on AT&T 3G and only work on TMobile 3G, and TMobile is slowly phasing out their 3G network, so eventually there will be no service in the US. 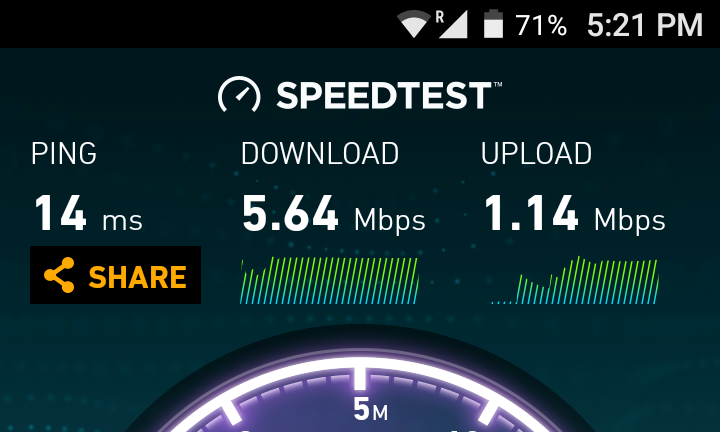 I think for US service, the newer LTE sim is a much better option anyway. As for service in Europe, per Tony, the Global sim still works in Europe, at least for now. If you use the Global sim in Europe, please feel free to leave a comment and report if and how well the Global sim works in whatever countries you visit. "Keep your FREE plan and get 5x faster speeds by upgrading your account today with a FREE LTE SIM powered by one of the best mobile network in the US. Keep your existing number and just pay 99¢ for shipping! Alternatively, you can choose to continue using your Global SIM and plan now that we've reached agreement with our current carrier to continue service. If you elect to keep your existing Global SIM and plan, starting with your February billing cycle, we will charge you $4.99 per month until you decide to change plans, upgrade to LTE or cancel service." So it appears that if you have a Global sim account, at some point you may get the email above (unless it goes in your spam folder), and then after that, FreedomPop may start charging you $4.99 per month. I'm a big believer in two sayings, "There's no such thing as a free lunch" and "If it sounds too good to be true, it probably is". Which is why, even though I read about the FreedomPop Global GMS sim a year ago, I didn't get one. I figured that the promise of free cellular data every month just sounded too good to be true, and therefore there must be some catch. But recently I gave my personal Republic Wireless smartphone to my son, and I needed to get a replacement phone for myself. I have have two phones (work and personal) and consider my personal phone to not be a "critical" phone because I can always use my work phone. So I decided to to buy a BLU R1 HD smartphone and to play around with a FreedomPop Global GSM sim. Well, I've had been using the FreedomPop Global GSM sim service many months now (since August 2016), and I am pleasantly surprised. It really does work. It's almost like there really is a free lunch! You do have to pay for the sim (but its cheap! ), and you might decide to pay an additional $5 to turn off the automatic top-up feature, but after that, you really do get free AT&T / T-Mobile 3G+ cellular data, and if you use Google Voice and Hangouts, you can essentially end up having FREE (limited) MONTHLY SMARTPHONE SERVICE! 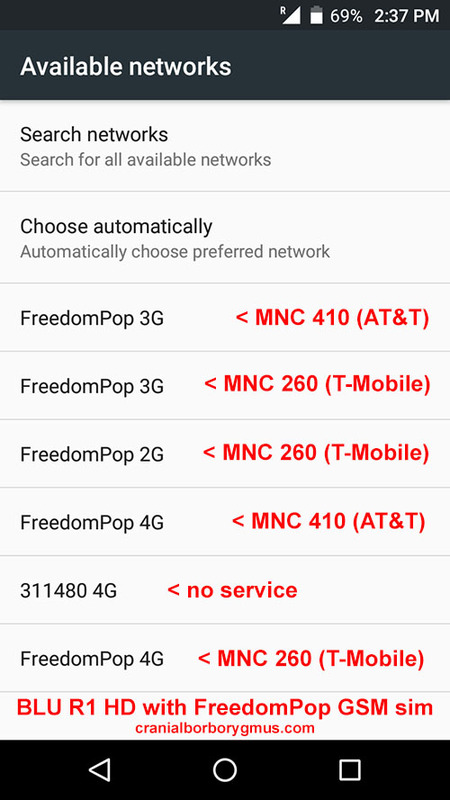 March 2, 2017: Although I have five FreedomPop GLOBAL GSM sims, I also have four of the new FreedomPop Nationwide LTE GSM sims, and now only use the LTE sims since I think they work better if you only need cellular data/service here in the US. I am continuing to update my LTE sim review with new information, so please also read my FreedomPop Nationwide LTE GSM sim review for the latest information and advice. Zero. Zilch. Nada. Free smartphone cell service (with limits) really does exist! I first heard of FreedomPop two years ago when I was looking to get new smartphones and service for my family because I wanted to ditch our overpriced T-Mobile cellular service and flip phones. At that time (and still) FreedomPop was offering low priced phones that worked on the Sprint network and provided free talk, text, and data. I read some negative reviews (mainly that the voice quality wasn't very good because it was voip based) and decided to look elsewhere. I thought if the service was free, it was probably not good (after all, if it was any good, why would it be free?). I just couldn't bring myself to trust a service that was free. I ended up going with Republic Wireless for three phone lines for our family, and we have been very happy with their service. I continue to strongly recommend Republic Wireless for reliable smartphone service at a great price. But recently, I needed a fourth phone line for the family, and decided to experiment with a free service. I remained skeptical of FreedomPop (based on old reviews) but decided to try them out. I ordered a $59 Blu R1 HD smartphone from Amazon, and then ordered a FreedomPop GSM sim to put in it. I planned to use an existing Google Voice number I have (which is free) and to use it for talk and text with Google Hangouts. I have great wifi at home, and use the FreedomPop GSM sim for cellular data when I am out and about. I'm quite happy with how well my new setup has worked out, especially for a FREE SERVICE. I wouldn't recommend this setup for your main phone line at this point, or for any work phones or "mission critical" phone lines. What I do recommend is that you set up a "backup" or "extra" GSM smartphone with the FreedomPop sim to see how it works for you. If you're like me, you'll be pleasantly surprised that you really can get free smartphone service that works... at least so far. :) January 2017 update - FreedomPop recently released a new Nationwide LTE sim that I've tested and like better. If you will be traveling and need cell service in one of the European countries where the international Global sim works, it's still a great deal, but if you just want service here in the United States, I think the new LTE sim is better. * You will need an unlocked GSM (ie. AT&T or T-Mobile) smartphone. The GSM sim will not work on a CDMA phone (i.e. a Sprint or Verizon phone). The phone must be unlocked, and must be GSM. I have used an Amazon Prime BLU R1 HD, an unlocked ZTE Zmax2 AT&T Gophone, and an unlocked Moto G4. * No contract. Cancel anytime. * Above plan is $19.99 per month after the first free month, but you can downgrade to the free plan at any time, and if you downgrade before the first month is over, you don't have to pay anything (as long as you don't continue to use more data that the free plan provides, see below). * The sim data speed is 3G (EDGE/HSPA/HSPA+ on T-Mobile/AT&T) and is not 4G LTE. * You can easily switch sims from one phone to another, or swap sims if your phone runs out of data. So far I've ordered five FreedomPop Global sim kits. I wanted to have several in case I decided to set up multiple phones (which I have) and for the future for backups or if I need to set up other phones. I set up a separate account (separate email) for each sim. I've been using FreedomPop 3-in-1 Global GSM sims in my Amazon Blu R1 HD GSM smartphone running Android Marshmallow with Google Voice for talk & text via Hangouts, and also in my unlocked AT&T GoPhone ZTE Zmax2 smartphone running Android Lollipop and also with Google Voice (second phone number) for talk and text via Hangouts. I have also confirmed the Global sim works in a new unlocked Moto G4 running Android Marshmallow that I just bought. I have good solid wifi at home where our smartphones work just fine without the need for any cellular service, and most of my data use is on wifi. I ordered my first Freedompop GSM sim card on August 3 and received it (via FedEX Smartpost) on August 9. Installing the sim was very simple. It worked right away. I turned off wifi, and then used the gsm sim service to check email, send a text, and make a call. It all worked. Since then, I've used the phone to talk, text, and check emails around town, and it continues to work. After verifying the first sim card worked, I set up a second FreedomPop account and ordered a second sim card on August 11, which I received on August 18. I swapped out the first sim card and put in the new second card, and tested it for a day to confirm it worked. I then swapped back to the original sim card. I have since ordered and tested more sims, and will use them for additional phones and/or backups, or if I need more monthly data for one of my phones. * Talking: Voice quality is fine at home when I am on wifi (which has nothing to do with the FreedomPop sim). When I have tested calling people when I am out and about, most of the time it works fine. Once or twice I have had a garbled connection, but I'm not sure if that was my phone or the person I was calling. I used the FreedomPop sim to call my father and talked to him for 35 minutes while I walked through our neighborhood. The connection worked the entire time. FYI: Google Voice and Hangouts used 22mb of data for 35 minutes of talking, or 2/3mb per minute. An hour of talk should burn up about 40mb. You can use this to calculate how much talk time you can expect if you are using Hangouts and relying on the 200mb or 700mb of free monthly data. * Internet surfing: checking my email accounts worked everywhere I tried. * Data Speed: I used SpeedTest to check the upload and download data speed. At home, for reference, on wifi (we have Cox basic internet in Santa Barbara, California) I got 5.64Mbps download / 1.14Mbps upload / 14ms ping. At home, with wifi turned off and using the FreedomPop GSM sim, I got 4.40Mbps download / 1.64Mbps upload / 245 ping. 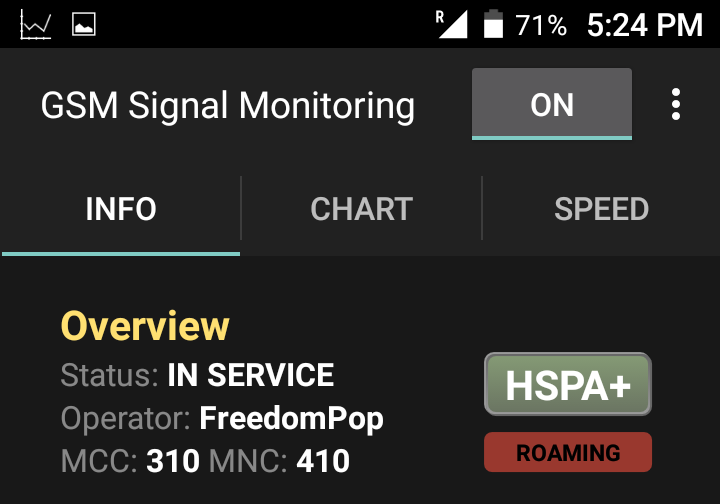 I checked the cellular connection using GSM Signal Monitoring and the provider is AT&T (MNC:410) and the service fluctuates between HSPA and HSPA+. I've checked the sim data speed around town with SpeedTest and have gotten similar results. Although we also have TMobile service in our area, the connection always seems to be via AT&T (MNC: 410). It's really pretty simple, but you need to follow directions if you don't want to get any additional charges, and also understand the rules on how FreedomPop works. When you buy the sim, you will be automatically signed up for a monthly pay plan, but the first month is a free trial. Your free monthly trial starts when the sim ships, not when you receive it. You need to downgrade your plan to the free plan before the end of the month (billing cycle), otherwise you will be charged the monthly fee at the beginning of the second month. Further, when you get within 100mb of your data limit, FreedomPop will automatically "top up" your account and charge you $15 to add more data to your plan. You can turn this feature off (which I recommend), but it costs $5 to turn off the "automatic top up". This becomes a $5 credit on your account. If you pay $5 and turn off the automatic top up feature, if and when you use up your monthly data allotment, your $5 credit will be used to pay for data at $.02/mb. When your $5 credit gets down to $2 left or is gone or expired, then when you get within 100mb of your free monthly cellular data limit, your data will be disabled until the beginning of the next billing period, when you will get your new monthly allotment of free data. STEP ONE) Order the FreedomPop Global GSM sim kit. Use a real email address to start your order, and remember it, because it will be used to create your account and account password will be emailed to it, so double check the email address you start with is correct! After you enter an email address and zip code, you will also need to enter your street address to start your order. Read and understand what you are ordering. Review the terms and place your order. You will be emailed an order confirmation, a temporary password, and tracking info after your sim ships. You will need the temporary password to log into your new FreedomPop account, so again, make sure you enter a correct email address when you start your order, and then after you order, check it for your confirmation and password. STEP TWO) Downgrade to the free plan within 30 days. Unless you want to pay for $19.99 (or $27.98) after the free trial month is over, you will need to downgrade to the 200 min / 500 texts / 200MB free plan. Your billing cycle starts when your sim kit ships (generally in 1-2 business days), and then you have 30 days to downgrade. You can downgrade right away, but I recommend waiting until you get the sim and try it out, and then downgrade. Also note that the free trial gives you 1GB of data. You can use up to that amount before you downgrade, but after you downgrade, you are limited to 200mb. If you've already used more than 200mb before you downgrade, that's ok, because it was part of the free trial. If you are over 200mb when you downgrade, you can't use any more for the rest of the billing cycle or it will be viewed as being over your 200mb of free monthly data and you would need to pay for it. So it's best to only use a bit of data to test out the sim, and then downgrade to the free plan before you use very much. 6. How To Correctly Downgrade Your Plan (and Service) to be FREE! > Find and click on the link "Details and Plan Management"
> Then click on "To downgrade your plan, click here"
> You will get the following warning screen: "Warning: you are about to downgrade your plan. By downgrading your plan, if you are on a trial, you will lose all additional minutes/messages/data. Any usage incurred above your new plan limits will incur additional charges." > Click "Downgrade anyway". You will need to click on a couple more screens and enter your password to confirm your decision. > Please understand how FreedomPop works: Before you downgrade, if you have already used more than the free amount of data (200mb or 700mb if you've added 10 FreedomPop friends), stop using data and wait a day or two to downgrade your plan. It can take up to two days for data to get reported, and any data usage that gets reported after you downgrade from the free trial that is over your free plan limit will result in charges. To be safe, downgrade your plan before you use 100mb, and then also disable Auto Top Up (see below). > Click on the "View Details" button. > At the bottom of the next page, you will see "To deactivate the FreedomPop Premium Plus service, click here"
> click the link to deactivate the service. You will need to click on a couple more screens to confirm your decision and decline any other service. You will eventually get the message, "YOU HAVE SUCCESSFULLY DOWNGRADED". June 4, 2017 update: THIS IS VERY IMPORTANT! There is an on-going "service downgrade bug" that I describe in my FreedomPop LTE review here. Please read it. You need to check your account overview page and make sure the Premium Plus service actually got removed. The service page may say it is removed, but it may still be on your account and you could still get charged $7.99. Please make sure you check and remove it if it is still there! > Go to "Billing > Billing Settings". You will see that Automatic Top-up is ENABLED. > Click on EDIT. When you uncheck the box, you will get the following message: "Because actual data usage may be delayed by up to 3 hours, to protect ourselves from fraud and leakage, you must have at least $5.00 in credits to turn off Auto-top up." > If you click "OK" to disable the Automatic Top-Up, you will be charged $5 and you will get a $5 credit on your account. Now if you hit your monthly free data limit, the data for your account will then get turned off until the start of your next billing period (technically, as long as you have the $5 credit and it is active, when you use up your free data you can then use an additional $5 worth of data at $.02/mb). I recommend spending the $5 and turning off the automatic top-up feature. Installing the FreedomPOP sim is simple. The first thing you need to do is remove the sim from the sim-carrier-card. 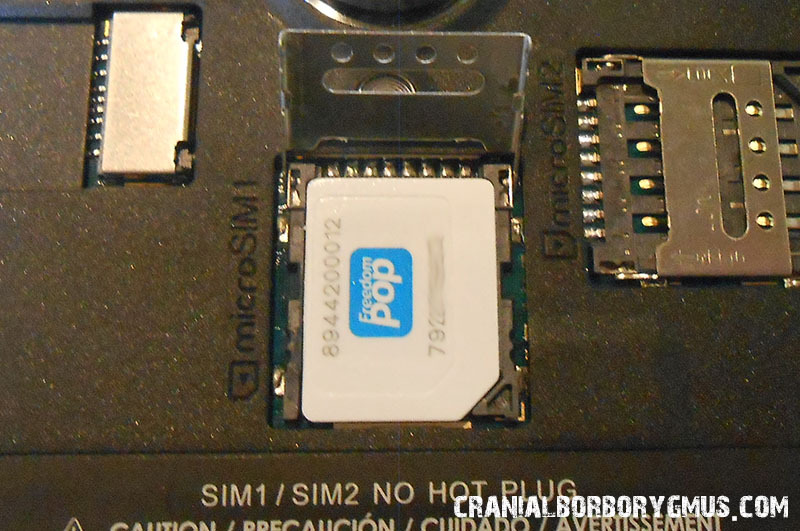 The FreedomPOP sim is a 3-in-1 sim, meaning that it can be three sizes... a regular full-size sim, or a MicroSim, or a NanoSim. 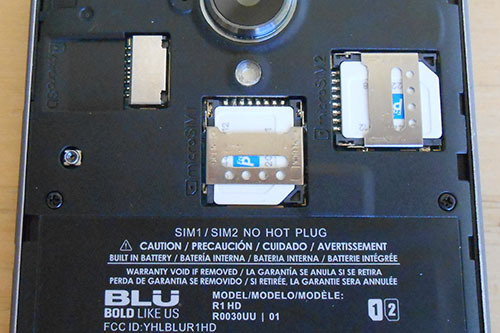 For the BLU R1 HD smartphone, I needed the MicroSim format. I've read that some people have a problem popping out the micro-size sim. If you pop out the smaller nano-sim by mistake, you can also pop out the now empty micro-sim holder, and put the nano-size sim in the micro-size holder to use it. That said, if you need a MicroSim, it's easier to pop it out at the right size. An easy way to remove the micro-sim is to place a few credit cards in a stack on a table to create a lip. The place the sim-carrier-card on the stack with the micro-sim cut-out lined up just offset from the lip. Use a small screwdriver and press down on the sim at the correct cut-out, and it will pop lose. Then pull the micro-sim card the rest of the way out. Refer to the picture below. Once you have the proper sized sim card, install it in your phone. - Download FreedomPop Messaging from the Google Play store. 3. Enable Roaming (instructions include the note: please disregard any message that states roaming may incur additional charges. FreedomPop will never charge for roaming. I skipped the first step and did not install the FreedomPop App since I'm using Google Voice and Hangouts for texting and talking. You don't have to install the FreedomPop app, unless you want to use it to get your free texts and voice minutes. I then entered and set my APN to freedompop.foggmobile.com and enabled roaming. Note: I didn't see "Cellular Networks" under Settings right away. I had to click "more" under "Wireless & networks" and then I saw [airplane mode | tethering & portable hotspot | VPN | Cellular Networks ]. After setting the APN and enabling data roaming, I turned the phone off and back on, but I don't think I had to. I turned off wifi and confirmed the FreedomPop sim provided cellular data by texting and checking email. The sim setup on the BLU R1 HD really was simple and painless. The really awesome thing about this FreedomPop GSM sim deal is that you can actually get 700mb of free data instead of 200mb per month. You just need to use the FreedomPop Friends feature and add 10 "friends" (other FreedomPop accounts). You get 50mb per "friend" (other account) with a maximum of 10 "friends" (for 500mb). Once you get 10 or more friends, as long as at least 10 remain active accounts, you get the 500mb bonus data every month. You do not need to add more friends every month. Your 10 "friends" will get you the 500mb of bonus data every month. This is as long as they are active, which is why I recommend adding some extra "friends" in case any drop out. How to find FreedomPop friends: I have a current list of people looking for FreedomPop Friends here. Feel free to get email addresses from the list, and/or add your email address to the list. To invite someone from the list, just cut and paste their email address into your FreedomPop account Friend Finder (look for "friend finder" or "FreedomPop Friends" on your account homepage, and then use the "Invite Friends" form and "Invite by Email Address"). People won't see your request until the next time they log into their FreedomPop account, so you might not hear back from some people for a while. But in general, it's pretty easy to get at least 10 friends fairly fast, and then you'll have the extra 500MB of data (700MB total) every month. The main benefit and feature of the FreedomPop Global sim is that it works internationally. According to the FreedomPop Global sim package, the Global sim works in the following countries: United States, United Kingdom, France, Germany, Italy, Spain, Switzerland, Austria, Netherlands, Belgium, Luxemburg, Sweden, Finland, Norway, Denmark, Ireland, Portugal, Greece, Poland, Hungary, Slovakia, Croatia, Romania, Bulgaria, and the Czech Republic. I went to Europe last summer (July 2016), but unfortunately my trip was just before I got my first FreedomPop Global sim, so I don't have any personal experience with how the sim actually works in these countries. I have read and reviewed numerous posts on other websites, and have summarized below in what countries the Global sim was reported to work and in what countries the Global sim was reported not to work. If you've used the Global sim internationally, please feel free to leave a comment reporting where you used it and how it worked. Based on numerous reports, it is clear that despite the packaging claim, the Global sim does not work in Hungary, but it has been reported as working in almost all of the other countries listed. problem - certain location sometimes initially has "no service"
Since I've been using the sim, I've found one location where I sometimes initially get a "No Service" warning on my unlocked AT&T ZTE ZMax2 phone. If I wait less than a minute, it always ends up getting at least a weak AT&T signal. Or I can manually change to the stronger T-Mobile signal. Both AT&T and T-Mobile claim to have excellent coverage at this location based on their coverage map, but the AT&T signal is poor (but is full strength about 100 feet away in any direction). One other time recently, in a different location, I found that I had full bars, but no data. I waited, but I still didn't get an internet connection (even though I was seeing good bars). I drove around a bit, but still couldn't get a data connection (but still had coverage bars displayed). I changed my network settings from Automatic to a T-Mobile network, and immediately had a good data connection. This leads me to believe that occasionally, for some unknown reason, the AT&T data connection may not work, but if you know how to do it, you can manually switch to T-Mobile and get data. A) How to determine if you are on an AT&T or T-Mobile connection: download and install the free app "GSM Signal Monitoring". When you run it, it will let you know if you are connected to AT&T (MCC:310 MNC:410) or T-Mobile (MCC:310 MNC:260), and also whether you are on HSPA (3G) or HSPA+ (3G+). 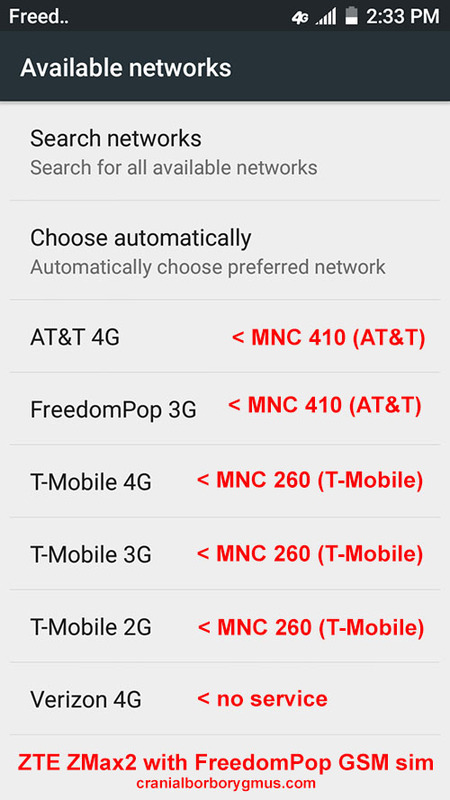 I recommend leaving your network set to "Choose automatically", but if you're having problems with your FreedomPop data connection, try manually choosing an AT&T or a T-Mobile network and see if it helps. Also, if after you switch to a different network, or back to automatic, if you're having a problem connecting to the internet, I've found sometimes it helps to toggle your phone into and out of airplane mode, which seems to reset the cellular network connection. Q: How long does shipping take? When will I get my new FreedomPop sim card? A: I've ordered four sim cards as you can see in the table near the beginning of this review. They all shipped by the day after I ordered, and I received all of them within 6 days (fastest) and 8 days (slowest). They all shipped via FedEX SmartPost from Indianapolis, Indiana, and were delivered to my house by the mailman. I am in Southern California. FreedomPop will email you the tracking information when they ship, and will also post the tracking number in a message on your FreedomPop account. Q: If I order multiple FreedomPop sim kits (more than one), is there anything special I should know? A: If you order multiple sims, I recommend creating a new account (use a different email account) for each sim. Then your accounts can "friend" each other. If you do have multiple sims (or other devices) on a single account, just make sure you understand that each one will have it's own separate plan and service options, and you will need to downgrade each of them to make sure you don't get any unexpected charges. This may not be obvious when you check your account because you may only see the plan price for the first device (sim). To see if you have more devices on your account, click on your name in the upper right hand corner (see image below). If all you see is the option to "log out" then you only have one device on the account, but if you see multiple devices, you will want to check each on and make sure you downgrade the plan and service for each one. Q: I got an offer during the ordering checkout process for "YOUR FREE GIFT WITH TODAY'S PURCHASE, One-time activation only $.01". What the heck is this? A: It is an offer for a second sim kit for $.01. You can accept the offer or skip it. If you accept the offer, you will be charged an extra $.01 and you will get a second sim kit added to your account. If you get the second sim, it will have also have a free trial plan and service, and you will need to downgrade the plan and service for it also. You should be able to access the second sim account on your FreedomPop account on their website by clicking on your name in the upper right hand corner. If you only have one sim (device) on the account, you will only see "log out" on the drop down menu, but if you have two sims on the account, you will see "My Device List" and you can toggle between the first and second sim. Just make sure you downgrade the plans and services for both sims! If you add at least 10 FreedomPop friends to your account, both sims will each get the 500mb bonus data. 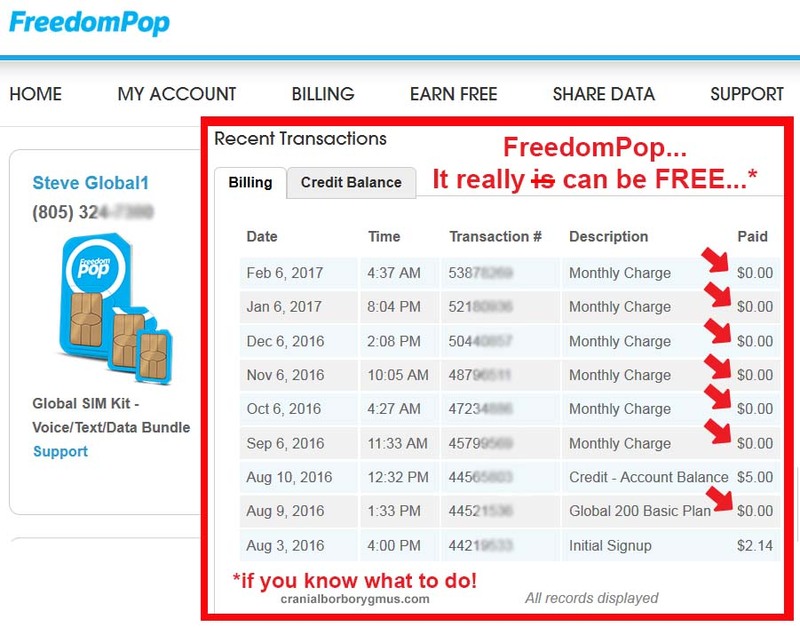 Click on your name in the upper right hand corner of your FreedomPop account page to access multiple sims or devices on your account. Q: Is there a big delay when I'm talking to people because the FreedomPop GSM data service has a London, England (UK) ip address? A: I've read people who say this, but I've not experienced it. It makes sense that because your voice supposedly has to go all the way to London and then back the the US, there should be a major delay, but I haven't experienced it, which makes me think that maybe the data doesn't actually go to London and back, or it's incredibly fast. I have checked and verified that the FreedomPop GSM sim has an ip address in London, but again, I don't get a big delay when I talk to people via Hangouts. I was wondering about this, and did a test just to verify how much delay there is. I called a US phone number in Los Angeles called Echo Back (+1 909-390-0003). If you call it, it will echo back whatever you say. It's a cool service, and you can use it to test your voice connection quality, as well as any delay. I had some fun doing this test. I put my smartphone on wifi and called Echo Back. I would say "Go" and then hit a stopwatch on my other smartphone to attempt to time when I heard the phone say "Go" back. It seemed to take about .6 seconds. I then hung up, took my phone off wifi so that it was using FreedomPop GMS cellular service, and called Echo Back again. I did the same test, saying "Go" and then timing how long it took to hear "Go" back. It was about 1.2 seconds. So calling from Santa Barbara to Los Angeles (about 100 miles) cause a .6 second delay, and using the FreedomPop GSM sim caused a 1.2 second delay. I personally don't thing a 1.2 second delay is that big of a deal, and I don't think it makes it any more difficult to carry on a conversation. Q: Is there a way I can test the FreedomPop GMS voice quality (or any other cellular service voice quality)? A: Yes, per the faq above, call Echo Back Voice Quality Test at +1 909 390 0003 and the automated service will "echo back" whatever you say. Q: How can this be free? What's the catch? A: I'm not exactly sure why FreedomPop is giving away free cellular data, but it is free, if you follow the instructions and downgrade the service. I would guess that FreedomPop is offering the free limited data service to grow their market share, and build brand awareness. The amount of cellular data FreedomPop is giving away probably really doesn't really cost them that much because they buy it in bulk. The basic service is free, but FreedomPop will attempt to "upsell" you, and will offer you all sorts of paid upgrades. When you downgrade from the free 1GB monthly data trial, they will warn you that you are going to lose a big chunk of your free data, and will then offer that you can save it and roll it over to the next month. You can sign up for a data rollover plan with a free monthly trial, and then it's $3.99 a month (or something like that) after that. Some people may want to pay that to bank and build their unused data. FreedomPop also doesn't allow you to just sign up for the free data plan to begin with, you have to sign up for a "free trial" paid plan and a "free trial" paid service, and then you have to be smart enough to downgrade both your plan and your service. So I suppose the catch is, you have to pay attention, and then it's free. I've purchased four FreedomPop sim kits, and I've never been charged anything other than the initial cost of the sims ($1.99, $1.99, $.99, and $.99) and $5 to turn off the auto-top-up feature on one of the sims (I'll probably do it on the other ones at some point too). Q: What happens if and when you hit your monthly data limit? A: When you get within 100mb of your limit, FreedomPop will automatically charge you $15 and will add a $15 credit to your account. This credit is then used to pay for data when you go over your limit. You are charged $.02/mb. If you use up your credit, you will be charged another $15 and the process will repeat. FreedomPop will do this up to seven times per month. There are two ways to avoid this. One is to simply stay at least 100mb below your data limit for the month. In Android, it's easy to set a cellular data warning limit and a hard stop for any monthly period you want to set. I've done this on both of my smartphones. The second and safer way to avoid the automatic top-up charge is to turn off the auto-top-up feature. This costs $5, and you get a $5 credit on your account. Then, when you get within 100mb of you monthly data limit, your data is turned off and disabled until your next monthly data period starts. If this happens and you have a second account, you can switch sims or share 100mb from the second account to the first account via FreedomPop Friends. Q: Can you put two FreedomPop GSM sims in the BLU R1 HD dual sim smartphone? A: Yes. I tried it and it worked. You put the two sims in, and then pick which sim (#1 or #2) you want used for cellular data, which for calls, and which for SMS. The BLU phone recognizes and labels both FreedomPop sims as "3 UK" (the partner company that supplies the GSM data I believe). I added #1 and #2 to the names to make it easier to manage them. I switched back and forth to test both FreedomPop sims, and both worked for texting and internet access. I ran SpeedTest on both, and got download speeds of 7.84Mbps and 6.87Mbps. Initially, the second sim did not work and wouldn't access the internet, but then I checked the settings for it and saw that I needed to "enable cellular data". It then worked. FYI: I also noticed that whatever sim slot you set for data, the other sim slot looks like it is limited to 2G (the Preferred Network Type says 2G and is grayed-out so you can't change it, see screenshot below). I don't know why, but that is what it looks like. This shouldn't matter if you have two FreedomPop sims, because you would only use one at a time, but if you had a FreedomPop sim and a different sim, the sim slot that is not set to data may be limited to 2G (or so it appears). Hangouts Observation #1: You have to add a "+1" to the beginning of a phone number if you're using Google Hangouts with the FreedomPop GSM sim to place a voice call. The FreedomPop GSM sim uses a UK (London, England) IP address. So if you are using Hangouts to place a call, Google will think you are calling from the UK, and will want you to pay for the call. However, there is a very simple fix. You just have to add the US dialing code (+1) to the beginning of any US number, ie. 805-555-1234 would be +1 805-555-1234. I simply added a +1 to the numbers I frequently call in my contacts, and with any new number, I remember to add a +1. Having the +1 does not effect the ability to call over wifi or any other carrier (you don't ever have delete it to make a call). So remember, if you're having a problem placing a voice call with Google Hangouts and the FreedomPop GSM sim, make sure you enter a "+1" before the area code. Hangouts Observation #2: When I initially set up Google Hangouts on my new unlocked AT&T ZTE Zmax2 GoPhone, I noticed that when people called me and I answered, they could hear me, but I just heard the ringing continue (I couldn't hear them). I looked all over Google but couldn't find an answer to the problem "Google Hangouts people can hear me but I can't hear them and the phone just keeps ringing." Finding answers to Google Hangouts problems can be hard. I eventually read a suggestion to uninstall and reinstall Hangouts. I did that, and when I was installing Hangouts the second time, it asked me if it could have permission to record voice and permission to use the microphone. It hit me that the first time I installed Hangouts, I probably did not give Google permission to record me (seems like an sketchy thing at first glance). This time I gave permission for both things (recording and microphone) and it solved my problem. I could hear people on the other end, and Google Voice calls worked great. Hangouts Observation #3: Another example of Google Hangouts "not working" (and me not realizing it was my own fault): My other smartphone using a FreedomPop GSM sim, the BLU R1 HD, is supposed to ring as a backup for (and in addition to) our OBI200 landline (I have that Google Voice number ring both our landline and the smartphone via Hangouts). But sometimes the BLU smart phone rings late, or doesn't ring at all. I spent a lot of searching on Google and found others with this same problem (Hangouts delayed ring to cell phone late or not at all). Unfortunately, no one seemed to have an answer, and most people said it was because it takes a while to find a cell phone on the internet or via cell service. But my ZTE Zmax2 with the new second Google Voice number was never having this problem, so it didn't make sense (why wouldn't both phones have the same problem?) Finally, it dawned on me! Our OBI202 landline has a cordless phone on it, and the cordless phone is a 2.4GHz model. My wireless router is also 2.4GHz. The BLU smartphone is on wifi, and when the cordless phone rings, it probably at times will interfere with the wifi signal, keeping the BLU phone from also connecting. I tested my theory by replacing the cordless phone with a corded phone, and the BLU phone rang on incoming calls. I also put the BLU phone on cellular (turned off wifi) and it then worked in conjunction with the cordless phone. So I learned that if your (wifi) smartphone isn't ringing when someone calls you on Hangouts, make sure it isn't because you also have a cordless phone (or anything else) interfering with your wifi signal. #1: FreedomPop really does offer free basic smartphone service (200 voice minutes, 500 texts, and 200-700mb of cellular data). To get the free service, you need to sign up for a free trial and then cancel the free trial (both the plan and the service). You then need to make sure you don't go over your free data limit. FreedomPop needs to make money to stay in business. They can only make money if some people pay for the service. They provide free basic service in hopes that some people with voluntarily (or by accident?) pay for premium services. They do have legitimate paid services if you want more monthly data, or unlimited talk and text, or data rollover, etc. The great thing about FreedomPop is that there is a totally free basic option, and you can decide if you want to get free service or pay. If you want the free service, you need to be able to read, pay attention, and follow instructions. It isn't that hard, but based on the number of people who complain about "surprise" or "unexpected" charges, it's clear to me that one of the ways FreedomPop makes money is from people who don't read or follow instructions. I see people who complain about being charged $5 (to disable auto-top-up, which the instructions clearly say will happen), or who complain they got charged $7.99 (because they only downgraded the plan and not the service), or who got charged $27.98 (because they never downgraded their plan or their service), or who got charged $27.98 (because they bought a second sim but never downgraded the plan and service for the second sim). If you get a charge you're unhappy with, from what I've read, you can contact FreedomPop and get the charge reversed, but I've never gotten any unexpected charges so I've never had to contact FreedomPop customer service. I understand not paying attention and/or not bothering to read the instructions. I'm often guilty of that myself. Usually, when I get something new, I toss the instructions aside and just try to use my new toy. That's why there's the old saying, "if all else fails... read the instructions." With some things, it's ok to skip reading the directions, but with FreedomPop, if you want free service, you need to read, pay attention, and follow the instructions (though it really isn't that hard). FreedomPop can be free, and for many of us it is. #2 The FreedomPop GLOBAL sim generally works, though sometimes the coverage can be frustrating. The GLOBAL sim usually stays connected when I'm out and about, but sometimes I find out the sim has lost its connection and I need to wait for it to reconnect and/or toggle airplane mode on and off. With the Global sim, I sometimes mutter to myself, "Well, it is free after all". With the new LTE sim, the only thing I've ever said to myself is, "Wow, I can't believe this is free". The GLOBAL sim gives you free cellular data coverage in many European countries. The FreedomPop service (voice minutes, texts, and cellular data) can be free, if you know what you're doing. You can get up to 500MB of extra data every month with FreedomPop Friends. You an set up multiple sims as separate individual accounts and share data between them (and also friend each other). The Global sim can roam on AT&T and TMobile. Because the sim uses a UK service, if you are using Google Hangouts, you need to add "+1" before numbers to be able to dial. Because the sim uses a UK service, Pandora won't work, and some other websites will think you are in the UK and will show you UK versions of their website. The sim sometimes loses its connection (service) and I need to wait a short while or toggle airplane mode on and off. The data speed is 3G or 3G+, but is not LTE. Mike, Thanks for pointing this out. I did see when I ran speedtest that the nearest server was London (I am in California). I don't use the sites you mention above, but I will investigate this more. As one really doesn't get that much monthly data with these sims (700mb though you can share even more from other accounts), I don't know if one would want to do that much video streaming with them anyway. Wifi with it's essentially unlimited data is always better, and in my case, I'm almost always on wifi. But if you need to access a site that is US restricted, it's good to know it could be an issue. Thanks for commenting! update: I used whatismyip.com, and when I am on wifi I am in California as expected, but when I am on FreedomPop my ip address is showing up as being in London, England. Good to know if anyone plans on accessing US restricted websites. I don't see it as an issue for me, but it's good to know. Are you able to put both FreedomPop SIM in the BLU R1 since it is a dual SIM phone. Tim, I was thinking about trying this but didn't need the extra data (my sims have 700mb each now, and I just don't use that much). But since you asked, I'll try it and will update this reply when I do. Thanks for commenting! update: Tim, thanks for motivating me to try this. I can confirm that you can run two FreedomPop sims in the BLU R1 HD dual sim phone. I just tried it and it worked. I put a second FreedomPop sim in the empty #2 slot on my Amazon BLU phone and set it up. I then set data use to sim slot #1 and sent a text, and ran a speedtest. I then changed data use to sim slot #2, and successfully sent a text and ran speedtest again. Both speeds were similar and good. I'll write more about this test above, but it does mean that if you have the BLU R1 HD phone, you could put in two FreedomPop sims, each with 700mb, and then switch to the second one if the first one runs out. Pretty neat! Thanks Josh. I plan to continue to add to this review as I learn more. So far, so good. I used your email address to send you a friend request. Thanks again for commenting! Thanks for the review! It was super helpful. Just a pair of quick questions: Which FreedomPop app do you have to use (on Android) for the 200 minutes and 500 messages? A quick check of the Play Store reveals several apps they've made. Also, is it possible to get the messages and minutes from the plan without using the app in question? Thanks! Hi Ian, I've never installed or used the FreedomPop app, but I think the correct Android version is called "FreedomPop Messaging Phone/SIM". The only way to get the free minutes and texts is to use the FreedomPop app (and the voice is over VOIP). I'll probably try it out at some point, but I've been using Google Voice and Hangouts for now. That means I'm using part of my free data for the Hangouts voice and text. The texts use almost no data (unless you MMS with pictures). The voice seems to use about .6MB/minute, so I can talk for an hour and use 36MB. I'm on wifi most of the time, and just don't need that much cellular data, so I don't mind using up some of my free data for Hangouts. I also like using my Google Voice number, which I can take and use on any carrier. To use the FreedomPop voice/text app, you need to use the assigned FreedomPop number (I think). Do they charge all the federal and state taxes - I currently have TING service and every month I get charged an additional $15.00 for taxes. So what does your TOTAL monthly bill look like? Hi Nicole, I know what you mean about taxes! My total monthly bill on all of my four FreedomPop GSM sims is $0. Because I don't pay anything, there are no taxes! I did have to pay the California sales tax (about 8% I think) when I bought each of the sim kits, but the monthly service is really free, and there are no taxes. You can see the image at the top of this review that shows my bill for one of my FreedomPop sims, and you can see that each month I am charged $0. Thanks for this information. So Helpful! Kevin, You're welcome! Thanks for your feedback! Thanks so much for this review/guide. I currently have two freedompop sims powering my google voice number, and everything seems to be working well so far. I did have to use a real phone number to verify my google voice account, and I'm told that it will intermittently ask you to re-verify to keep your google voice number active. This process requires a phone number from a major carrier, (not a voip number) which basically means not free. I'm curious how you get around that as I'd love to ditch my original carrier, which was the whole point in starting all this, so I'm curious if you have a work around for that. Hi Ian, You're right, you do have to enter a real phone number when you sign up with Google Voice, and then Google will send you a code via text (or robo-call you with it if you prefer), and you need to enter the code to complete your Google Voice sign up. I used one of our Republic Wireless phone numbers when I signed up with Google Voice. I currently have two Google Voice numbers. I just checked and my new google voice number still has a Republic Wireless number on the account, but my older google voice number doesn't. I pretty sure I deleted the RW number from that account a few months ago when I was setting up the new second Google Voice number account (because I used the same RW number and it can only be associated with one Google Voice account at a time). I'm not sure you need to keep a "real number" on the account. I think you can delete it, but if you do, you may get messages from Google asking you to "secure" your Google Voice account by adding back a "real" phone number. I think it's just for extra security in case you need to access your account (i.e. if you forget your password). When I log into my Google Voice account, Google asks me to add a "Recovery number" or a "Recovery email" for this purpose (if you forget your password or it is stolen). However, as long as you use your google voice account with hangouts on a smartphone, I believe the account will stay active. Thanks for your comment! Thank you for your in-depth guide to freedompop. I just purchased it using your instructions. Could you please add me [email address removed] as a free data friend? Thanks for commenting, and I hope the Freedompop GSM sim works as well for you as it has for me. I used your email address to send you a friend request. Hi Bruce, Thanks for your comment. I know other people recommend using a virtual credit card just in case, so thanks for describing the different options. I used a regular card, and have never had any problems, and I've been using FreedomPop for over three months now. I've purchased four sims so far and have spent $11.40 total so far. I've never gotten any unexpected charges. It's important to be able to follow directions, and downgrade both your plan and service. Spending $5 to disable the automatic top-off feature is also a good idea, though I've only done that on one sim so far. I used your email address to send you a friend request. Hey Steve, me again. This guide helped me a lot, and I've finally hit the end of my billing cycle/free trial period, and I'm happy to say that I haven't been charged a cent. I would like to give you some info that isn't in your guide though. You state specifically that if they offer you a second sim to not sign up for it as it does not get the friends (500mb) bonus. I got the offer for a second sim for .01 cent additional on one of my two orders and went ahead and got it for no real reason. For the first month you were absolutely correct. I only got my 500mb friend bonus on the first sim in that order no matter how many friends I added (and I added a lot). However, now onto the second month, my data limit on that second line has gone up to 700mb. Maybe they changed something? Anyway, thanks again! Ian, Thanks for the update. I never actually purchased the second sim offer, so I was just repeating something I had read somewhere else I think. I will update my guide. Thanks again! Hello Steve, I use a free phone app called "Talkatone". It assigns me a free USA telephone number from which, through the app, I can make and receive FREE voice calls and send and receive free texts without limitation to any telephone number in USA, Canada and even abroad. There may be a nominal fee for 'dialing' numbers abroad, but as of yet, I've never been charged. This has worked virtually flawlessly as long as I am connected to wifi either at home or wherever free wifi is offered. Texts go through instantly and voice calls are generally quite clear with little delay and very few drops. So overall, I've been pleased with the Talkatone service. However, for those times when I'm out and about where there is no wifi available, I need some sort of data connection so I can make and receive a phone call if necessary and possibly text and check messages. I don't have cellular service with a mobile phone carrier because it's just too expensive for me. Somebody told me to look up FreedomPop and I stumbled across your very comprehensive review and it sounds like a reasonable solution for me. Although, until I actually get using it, I'm not going to really know how much data I'll need but it definitely sounds worth a try. You said: "...The second and safer way to avoid the automatic top-up charge is to turn off the auto-top-up feature. This costs $5, and you get a $5 credit on your account. Then, when you get within 100mb of you monthly data limit, your data is turned off and disabled until your next monthly data period starts..."
So if when within 100mb of the monthly data allowance, the data is turned off and disabled, doesn't that cut us short by 100mb of our monthly allowance? Hence, if our monthly allowance is 200mb, that cuts us down to 100mb. Also, if FreedomPop is a wireless internet and mobile phone service provider based in Los Angeles, why do they route their services through the UK? If necessary, could I counteract that by running a USA proxy? Hi Kim, Thanks for your comment. I haven't heard of "Talkatone" before, and will have to check it out. Sounds like it might be similar to and an alternative to Google Voice. Very interesting. Because the FreedomPop GSM sim is so cheap, if you have an unlocked GSM smartphone, I would recommend you try it out to see if the cellular service meets your needs when you are off of wifi. It could be just what you need. Be sure to downgrade both the plan and the service to free before your 30 day trial is up. To answer your first question, yes, when you get within 100mb of your monthly data limit, you will either automatically be charged for $15 worth of additional data to be added to your account so you don't run out, or you can turn OFF this feature (for the $5 credit charge) and then your account would be disabled when you get within 100mb. This is because there is a delay in reporting data. And yes, it does effectively reduce the 200mb of free data down closer to 100mb, which is why you would want to add 10 "friends" to get another 500mb of free data every month. Then your limit would be 200 + 500 -100 = 600mb. You can also get a second sim and get the same amount of data built up on it and then swap sims if you get to the data limit on your first sim. I've never had a problem with not having enough cellular data for the month. To answer your second question, yes, the GSM data runs through a server in the UK. FreedomPop is based in the US. They partnered with a British company (3UK) to offer this international GSM sim card, which works in 25 countries including the US. 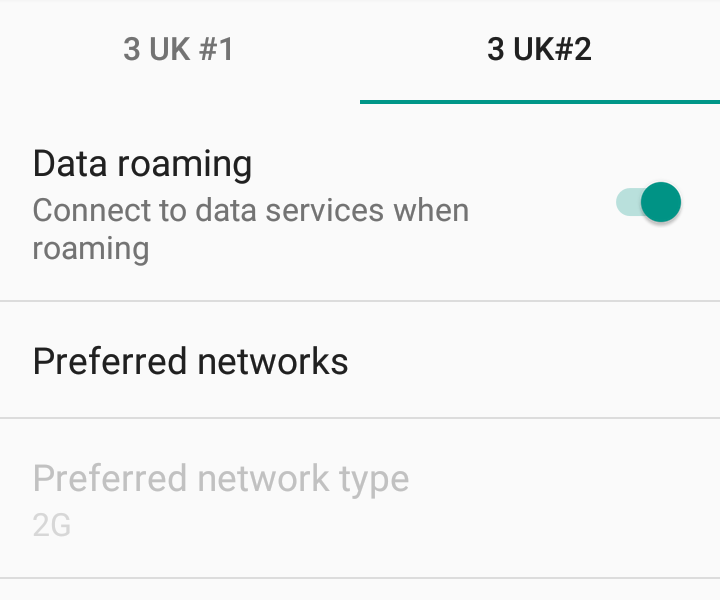 The US data is AT&T and T-Mobile, but it is through an international roaming agreement via this British company, which is why you have to use the foggmobile APN and enable international roaming. The British IP means that Pandora in the US doesn't work on cellular data, and you have to add "+1" to US phone numbers dialed through Hangouts, but other than that, it's never been an issue for me. I do believe some people have used various VPN apps/services to get around this if they needed to. Hope this all makes sense! Yeah Steve, it makes sense although it would make more sense to me if FreedomPop contracted directly with local services in USA rather than routing it all through the UK which one would THINK would be more expensive for them but apparently not. Ironically, I am in the UK at the moment using a Pay-and-Go SIM from 3Three Mobile. It works out cheap enough here but when I return to USA, they will cut my international roaming off after 2 months. Not satisfactory. So FreedomPop will be getting it's trial run in my old Samsung Galaxy S3 as soon as I can get the SIM ordered and delivered. Hi Steve, thanks for the "friend" add. Please add my email above to your friend list as I ordered a second card using a second email as you suggested. Received my first SIM and downgraded the Plan and Service to get to the basic free plan. So far it is going well. I couldn't have done it without your comprehensive guide. I also paid the $5 to avoid the data top-up fee. I am using the "FreedomPop Messaging" app and I noticed 2 things. First, even if you are on WiFi you will use plan minutes. A forum post I read explained that this is correct and not to worry. Second, using plan minutes does not seem to use up my allotment of data. So if this is true, I can get more talk time by using GoogleVoice (worked fine) plus the 200 free plan minutes. I am using the free plan as a spare phone to keep in the car. That way if I run out the door without my phone (it happens) or my battery is discharged I still have a working phone. Working out well so far thanks to you. Bruce, Thanks for your positive update and your observations on how the FreedomPop Messaging app counts the 200 free minutes. From what you saw, minutes on cell and wifi both count against the 200 total minutes, but they don't use any of your free cellular data. That's good to know. I still prefer and continue to use Google Voice and Hangouts instead of the FreedomPop app, but it's good to know how the app's accounting works. I used your second email address and sent you a friend request from a couple of my FreedomPop accounts. Thanks for the helpful details. Would like to connect as a friend for some free data! Hi Dave, Thanks for your comment. I sent you a couple of FreedomPop Friend requests. Hi Rovan, Thanks for your comment. I sent you a couple of FreedomPop Friend requests. Hey Steve, back again. I went ahead and ordered the FreedomPop Global 200 SIM. I followed your instructions and downgraded my plan and downgraded my service. I nearly missed the service downgrade. I thought I had done it all until I re-read your instruction and looked more carefully. The downgrade option is nearly grayed out and in very tiny print at the bottom of the page. And then, to make things even more difficult, I'm operating on a tablet size screen and the "downgrade anyway" link wasn't in sight and no option to scroll so I moved to a computer with a bigger screen to get the job done. :) Don't think I could have done it without your instruction. Do I understand correctly that they will hold the $5 credit (for disabling auto-top up) for 90 days and then it disappears? Under Billing and Credit Balance they say, "Your balance remains active for 90 days after your last credit activity from your FreedomPop device." Is there a way of utilizing that $5 credit without having to pay any more? Funnily, the FreedomPop SIM only cost $0.25 (plus 2cents tax). Such a deal! I would have thought they would have sent it out in a prepaid bulk envelope but no. They're sending it out with Fed-ex and it's scheduled to take a full week! Seems crazy! I will probably also install and have a look at their software if it means getting a free 200 minutes of calls every month that don't prey on the data allotment. I don't know how the friends deal works but feel free to add this email address. Not sure whether or not I actually have to have the SIM installed or if the add friends thing can be applied to my FreedomPop account online. Still waiting for the SIM. Also, I've only got one SIM slot in my phone. When I travel back to the UK, I use a Pay-and-Go SIM with a UK telephone number for the time I am there, usually a few months every year. How long can my FreedomPop SIM sit in the drawer before my account goes inactive? Or rather, how often should I pop the SIM in while I'm over there to keep the account active? Is it possible to get a FreedomPop SIM with a UK telephone number as well? I was struggling to figure this out while I was over there last time. Hi Kim, Glad to hear you got both your PLAN and your SERVICE downgraded. I think some people downgrade the PLAN and think that's all they have to do, and then get angry when they get a $7.99 monthly service charge the next month. You have to downgrade both the PLAN and the SERVICE! As for the $5 charge to turn off Automatic Top Off, it will be an active credit for 30 days, but then go dormant. If you look under billing, you can reactivate it (as many times as you want). I don't know if you have to always "reactivate it", or how long it lasts if it goes dormant. I've "reactivated" my $5 credit a couple of times now. If you don't, maybe after 90 days you would have to contact customer service to get it reactivated. But anyway, my understanding is that once you pay the $5 "credit", Automatic Top Off is permanently disabled, and if you use up your monthly data (or get within 100mb of your limit), then your account is suspended until the next billing cycle, but you won't get charged for any more data. If your monthly data does runs out, you can switch to a second sim, or "lend" yourself 100mb from another sim account. I don't know anything UK sim cards or numbers, or if they exist. I think you can add 100 minutes of international talk for free on your FreedomPop account if you are using the FreedomPop app. Or you could use Google Voice and Hangouts. As for how long your FreedomPop GSM sim can sit around unused, I'm not sure. I don't know if there is any limit at all. I use two GSM sims regularly, but I have another sim that I only used once when I first got it, and a fourth sim I've never used, but all four sim accounts indicate they are "active" (and haven't cost me anything other than the original sim purchase price and $5 on one account to turn off Auto Top Up). In any event, thanks for all your comments and thoughts! I hope the FreedomPop GSM sim works out well for you. I sent you a couple of FreedomPop Friend requests. You can start adding Friends and getting extra monthly data as soon as your account is active, you don't have to wait until you get the sim. Oops, Steve please edit my previous comment, I see where you clearly explain how to downgrade and not get charged for data. If you do not have the FreedomPop Messaging app installed how do you keep track of your data for use with Google Voice? Hi Bruce, As you probably read somewhere above, you can use the "free trial data" but you want to stop using a lot of data for a few days before you downgrade to the free plan. There is a delay (supposedly only 3 hours but I think it can be up to 3 days) in reporting the data, so if you end your free trial and then a lot of data use gets reported after that, it can put you over your limit of data under the free plan. As for keeping track of the data that Google Voice uses... for my testing I noted how long I talked and then saw how much data FreedomPop said I used for that time (I only used data for talking). That's how I figured out Google Voice uses about .6mb per minute. So if I talk for 100 minutes, it would use roughly 60mb of data. One can also look on your Android phone under "settings" and then "data usage" and it will show how much data each app used (including Hangouts). Most of my talking is over wifi, and I don't do much talking on cell, so I don't worry about how much data it uses. But I've also set a data limit (also under settings) on the phone to give me a warning at 450mb and turn off data at 500mb, even though the sim is good for 700mb (but I think would stop working around 600mb since I've disabled Automatic Top Off). Hope this helps. Very nice review/tutorial. You have saved me and a lot of other folks several headaches in dealing with the "fine Print" of their sign up process. Please sign me up as a friend, just placed the GSM Sim order. Hi Gary, Thanks for your comment. I sent you a couple of FreedomPop Friend requests. Hi Carl, Thanks for your comment and question. I don't know anything about that reseller or other resellers. I'm not sure what they are doing, but I personally wouldn't go through a middleman or reseller, as it is so easy to just buy and set up a FreedomPop GSM sim on your own. There are some people who are concerned about using their credit card and then getting unexpected charges, but I've bought four GSM sims with a regular credit card and have never had any billing problems. I personally would be more worried about giving my credit card to some random internet reseller, rather than FreedomPop. Per my comments above, I've spent a grand total of $11.40 on these four sims, and in four months have never gotten any other charges. But if you want, you can use a "virtual" credit card as described in a comment above, or use a pre-paid Visa gift card. But I've used my regular credit card with no problems at all. After you order the GSM sim, you just need to downgrade the PLAN and the SERVICE. As for the automatic top-up, I paid a $5 credit on one sim to disable it, but not on the others. It's just as simple to set a cellular data limit on your phone, but if you use the GSM sim and like it, for piece of mind, I recommend you spend the $5 to disable the automatic top off (just in case). And as for getting FreedomPop friends to get the extra 500GB of data, drop me another comment with your email and I'll send you a couple of Friend requests. I also give a link above that takes you to the most recent comments on a SlickDeals thread where people post their emails and ask people to "friend" them. It's really simple to get 10 "friends" and get the extra 500GB of data. Buying it yourself and setting it up also means you then know what to do if you want to buy and set up additional sim cards (like I did). So to wrap this up, I'm not familiar with that reseller, but I don't see why you wouldn't want to just by the sim yourself. Hope this helps. Hi David, Thanks for commenting. I sent you a couple of FreedomPop Friend requests. thanks for the comprehensive guide. please add me as a friend. Hi Jacob, Thanks for your comment. I just sent you a couple of FreedomPop Friend requests. Thank you so much for putting together this guide; it is very much appreciated! Just ordered my SIM, would appreciate an add if you can. Hi Kev, Thanks for commenting. I sent you a couple of FreedomPop Friend requests. Thank you for the useful guide. Can you please add me as a friend. Hi Keshav, Thanks for commenting. I sent you a couple of FreedomPop Friend requests. Thank You so much again for this wonderful guide. Can you please add me as a friend. P.S. This is my second account. Thanks again! Hi Keshav, no problem! I sent FreedomPop Friend invites to both your email addresses! Hi Joseph, Thanks for commenting. I sent you a couple of FreedomPop Friend requests. Hello, Should I be concerned if I have a red bar at the top of my freedompop account page? Hi Keshav, I think that red bar means your account is suspended (or was at least temporarily suspended). I've never seen the red bar on any of my accounts. I would go through your account settings and see if you find anything. Does your sim card currently work? Is there a problem with the credit card on your account? Did you use up all your free data? If your data is used up and you disabled auto-top-up, then your account will suspend until the next monthly billing cycle, but if you have another FreedomPop sim, you can swap it into your phone and use the data on it. Good luck! Hi Steve, I initially signed up on Dec 4th and I paid the $5 to disable auto-top up. This $5 remained as a credit on my account until Jan 5th when it showed up as "expired". I saw a "reactivate" link which I clicked, and it appears now that my $5 credit has been reinstated. But I'm confused by, "Your balance remains active for 90 days after your last credit activity from your FreedomPop device." What does that mean? My balance apparently only remained "active" for 30 days and then it expired, so what does the 90 days apply to? How many times can I "reactivate"? Hi Kim, I agree it's a bit confusing. Here's my understanding of how it works. You have to put a $5 credit on your account to turn off the auto-top up. The credit is good for more data if you run out during the month. The credit "expires" and becomes "inactive" after 30 days, but you can renew it. I agree the statement about 90 days would seem to apply to how long the credit is active, but I think it means when it expires, you have 90 days to reactivate it with an easy click. If it was expired for over 90 days, I think you might have to contact customer service to get it reactivated, or maybe at that point you lose it. In any event, I think you can reactivate it as many times as you want, as long as you do it within 90 days of it expiring. I only paid the $5 "credit" to disable the top-off on one of my sims. From my own experience, the credit does expires after 30 days. Then when I notice it, I click to reactivate it. Looking at my account, I've reactivated the credit three times so far. I'm tempted not to reactivate it just to see what happens, but so far I've always clicked and reactivated. In the end, I don't care that much about the credit. I look at it that I paid $5 to turn off "automatic top off". However, for some reason, I think from FreedomPop's standpoint, I didn't pay $5, I just added $5 credit to my account (that I don't think I can ever get back). I'm guessing this minor distinction is for legal or accounting reasons, but I don't know. I think they then expire the credit after 30 days for accounting reasons, which is ok by me, since all I care is that if I happen to use up my data I don't want to be automatically charged $15 for credit for more data. I'd rather the data just stop until the next billing cycle (since I could just switch to another sim if I really had to). That's what I spent the $5 for in the first place. So whether or not the $5 credit is active or expires really doesn't matter that much to me. If at some point I "lose" it, I don't think I'll really care. But for now, if I happen to notice it has expired, I go ahead and click to reactivate it. Hope this helps! Thanks Steve for that clarification; it all makes perfect sense and you write so well, I find it very easy to understand. I realize now that I need to log into my account online at least once every 30 days (or before 90 days) and get that $5 credit reactivated. Because, as I suspect, FreedomPop are probably hoping a lot of us will forget about it and that's how they'll make a few extra bucks. Those of us who are rotating between multiple SIM's and possibly even multiple carriers, could very well lose track and forget about it. 90 days is a reasonable time to reclaim the $5 credit. And I'm thankful that FreedomPop don't charge that $5 every month. It's a pretty good deal. I hope they keep it that way. Thanks again. Hi Kim, Thanks. Just to confirm, as I understand it, even if you let the credit expire and eventually "lose" it, you don't have to ever pay $5 again. The $5 "credit" payment is a one-time requirement to be allowed to disable the automatic top-up feature and turn it off. Once it is turned off, it stays off. You do not have to pay to keep it off. It would be nice if FreedomPop had it disabled (turned off) by default, and then let customers turn it on if they wanted the feature, but I think this is their way of getting an extra $5. One can chose not to pay it and just be careful to not go over their data allowance (which isn't that hard), but I don't mind paying the one-time $5 credit for the peace of mind knowing that I won't be billed if I use up all my data. OK Steve, I am with you in that I was viewing the $5 credit as a payment to just keep auto top-up turned off. Because like you, I'd rather have my data service turned off and switch SIM's before getting charged extra fees unnecessarily. However, you said, "The credit is good for more data if you run out during the month." This begs me to ask, at what rate do FreedomPop charge for their data? How many MB will the $5 buy? I cannot find a schedule of fees with regards to how my credit is used if I go over my limit. Elsewhere you've stated, "Now if you hit your monthly free data limit, the data for your account will then get turned off until the start of your next billing period." So now I'm wondering, which is it? Will they apply my $5 credit toward excess usage or will they turn off the data? My one thought is, as you have stated, the $5 is a one time fee to keep auto top-up turned off. I think they apply that fee as a credit to your account with the hope that you'll use that credit towards one of their premium plans or extra services. I am not so sure that the $5 credit is used towards extra data costs should you go over your limit. The deal, as I understood it, is that without auto top-up, they will shut off your data as you approach your limit so that you do not go over. In which case, I don't see how the credit could be applied for more data if the data's being shut off until the next billing period as discussed earlier. Another thought is, it seems to me that if data reporting is actually delayed by a few hours as FreedomPop claim, and they've required the $5 buffer in place to protect themselves as they claim, and they very specifically state, "you must have at least $5 in credits to turn off auto top-up", I could nearly conclude that you must have at least a $5 credit in place to KEEP auto top-up turned off. Therefore, I could also conclude that if you do not keep your $5 credit activated or somehow otherwise use it up and no longer have it in place as a credit, that auto top-up could reinstate itself because now FreedomPop have lost their protection. FreedomPop state that you must have $5 in credit to turn auto top-up off. Without $5 in credit, it's no longer turned off. Does it kind of make sense? Without your interaction to keep the credit active, FreedomPop have a window of opportunity to charge you that $15 if you exceed your data limit. I guess the only way to find out is to not keep your $5 credit activated, then approach the end of your data limit and see what they do. The experiment may not be worth the extra $15 to you. I expect you are right about the $5 credit being a one time fee. But when I read what FreedomPop actually say, I could understand it otherwise. Separately, under the tab entitled "Earn Free"/"Complete offers", I read, "Complete the offers below and earn unlimited free data this month." But whenever I look at this page, it is completely blank under those words and I am just wondering what offers they're talking about. I wondered if it's because I have an ad-blocker that I cannot see any offers. However, I did disable the ad-blocker and I still could not see any offers which apparently is something separate from adding "friends". So if you know what offers they're talking about (apart from adding friends), maybe you could enlighten us? :) Thanks again. Hi Kim, I think that data is $.02/mb, so a $5 credit would pay for 250mb, and a $15 credit would be good for 750mb. If you don't disable automatic top-up, when you get within 100mb of your monthly limit, FreedomPop will charge you $15 and add a $15 credit to your account, and your data will stay on so you can go over your free monthly limit. If your monthly limit is 700mb, this should happen around 600mb, as I understand. If you then used 800mb that month, you would owe them for 100mb, so your credit would be reduced by $2, and you would have $13 left. However, if you kept on using data that month and used up the credit ($15 = 750mb), then you would be charged another $15, and the process repeats. FreedomPop says that they do this automatically as a "courtesy" to insure you always have data available. I read somewhere that there is a limit, and they will only do a maximum of seven automatic $15 "credit" charges in a month (assuming you keep using up data). <edit> This is from the FreedomPop website: "FreedomPop uses an 'Automatic Top-Up' feature to ensure you are never left without broadband access when you exceed your subscribed Monthly Plan limits. The default top-up amount is $15.00.... In any billing month that your usage is within 100mb of your Monthly Plan broadband data allotment limit, your FreedomPop Account will be charged the automatic top-up amount using the registered payment method associated with your FreedomPop Account. As your broadband data use exceeds the broadband data allotment of your Monthly Plan, an amount equal to your total additional usage multiplied by the additional cost per megabyte as defined by your Monthly Plan, will be deducted from your FreedomPop Credit Account balance. When your FreedomPop Credit Account balance falls below $2.00, your registered payment method will be charged the applicable Automatic Top-Up amount as described above. This payment will occur each time your FreedomPop Account balance falls below $2.00 to prevent an interruption in the Broadband Service we provide you... If you do not use your Account Credit for a period of 30 days, FreedomPop will place your Account Credit on inactive status. You can reactivate the Account Credit by following the reactivation link at https:// freedompop .com/billing_overview.htm Account Credit on inactive status is not refundable." If you disable automatic top-up, I think FreedomPop states that when you get within 100mb AND YOU HAVE LESS THAN $2 IN CREDIT, then they will suspend your account until the next billing cycle begins. So if you have a $5 credit that is active, you can go over your limit (up to 150mb or $3). But after that, then you would have less than $2 in credit, so then your account would be suspended. If your credit is not active (or was used up), then they should just suspend your account when you get within 100mb of your free monthly limit. So I shouldn't have just said, "...if you hit your monthly free data limit, the data for your account will then get turned off until the start of your next billing period." I should have said that when you have less than $2 in credit left and you get within 100mb of your data limit, THEN your account will be suspended. In any event, I'm fairly sure that once you disable the automatic top-off feature, it stays off permanently, even if your credit expires and is "lost". If you have active credit, your data stays on and you can use it, but once your credit level drops to $2 left, then your data stops and your account gets suspended until the next billing cycle. Hello, in 2nd FAQ regarding two Global SIMs you wrote: "you'll need to switch to the second sim (device) by clicking on your name in the upper right hand corner to get to your second device (sim)." Are you talking about Freedom website or Freedom app on phone? On app I do not see my name in "upper right hand corner". Hi Morris, Thanks for your question. I was referring to when you view your account on the FreedomPop website. In the upper right hand corner, you can click on your name to change accounts and/or log out of your account. I always access my FreedomPop account from my computer. But I just logged into one of my accounts from the FreedomPop app on my FreedomPop Moto E2. It appears that if you are using the FreedomPop app, you select the "screwdriver & wrench" symbol at the top, then select the little blue face icon in the upper right corner. On my account, I only see the option to log out, but if you had a second sim, I believe that's where you'd access the plan & services for it. I think it's easier to do it on the computer though. Hi Thomas, Thanks for the information. That's good to know, if they actually do that. However, because there can be a delay in data usage being reported (FreedomPop says 3 hours, but I've seen it be a few days), I'd be a little nervous that although you can use more of your free data, it might also make it easier to accidentally go over. If you do manage to accidentally use more than your free data allowance before before your account is temporarily suspended and your data is cut-off for the rest of the month, I don't know if FreedomPop would then expect you to pay for the overage, but I wouldn't be surprised if they do. Just to be safe, I've set a data warning limit and a data cutoff on my phone, and I recommend others do it also. It's pretty easy to do, and it's just a little additional insurance. Thanks again for your comment and the info! Hi Thomas, I actually just ordered one of the brand new FreedomPop US-only non-roaming AT&T LTE sims yesterday (Sunday). I was hoping for a deal too, but I think it may be a while until that happens, so I decided to just go ahead and get one now. I'm hoping to get it by the end of this week, and after I have a chance to play around with it a bit, I plan to add to details about it to this review or write a separate review. Stay tuned! Hi arimala, I'm glad to hear my review helped you. Thanks for commenting. I sent you a couple of FreedomPop Friend requests. Thanks for this great information. Just ordered my sim card. Please add me to the friend's list. Hi Tim, Thanks for commenting. I just sent you a couple of FreedomPop Friend requests. Thanks for your helpful reviews. Got my sim set up. Decided to just use the freedom pop app to get the free minutes. Cheers. Add me as a friend please. Hi Frank, Thanks for commenting. I sent you a couple of FreedomPop friend requests. Thanks for your helpful tips and review. I have a question here. I have a free plan in the past and then ordered this 1 cent sim card to use with another phone. Both plans are under the same account which means they are sharing the same phone number. If I cancel my old voice plan and only keep the data plan that sim card provides, will I be able to still keep my phone number? Thanks again! Hi Sam, I think when you order a sim, you pick a phone number for it, so your penny sim probably has its own new number. If it is on the same account as your old device, you can log into your account on the FreedomPop website and then click on your name in the upper right hand corner, and select the sim kit, and see if it has a different phone number. But to find out how to do what you are asking, I think you will need to contact FreedomPop support and get their assistance. Hi Steve, Thanks for your reply. I made a call using my sim card and it showed the same number and on their website there is only one number listed. I will try their support to figure it out. Thanks! Great page, very informative. I am trying to determine the value of the "global" part of this plan. From what I read, it will only allow you to use your FP data in Europe to make calls to the USA. If you use that data connection to connect to G.Voice(GV), then you will be charged the very small and reasonable charges by GV to call Eurpoean numbers, or free GV calls back to the USA, again using the FP data. This would be completely without their app on the phone. If one installs the FP app on the phone, my suspicion is that it would not make or receive calls to/from Eurpoean numbers. My goal is to use this service when standing on a street in Belgium or Germany and trying to get an UBER !!!! They have to be able to text or call you from their European phones. The other option that most people seem to use (I have not previously done this) is buying a European simcard with data on it to use while in Europe. Thoughts? Do I have this right or wrong? Anyone with experience? Hi Larry, The FreedomPop Global sim is supposed to work in 25+ countries, including Germany and Belgium. Assuming it works, it would give you a data connection. You could then use Google Voice with Hangouts to make international calls from your US Google Voice number to a German or Belgium number. You are correct that there is a minor charge per minute. Or you can use the FreedomPop app. It includes 200 voice minutes and 500 text for domestic (within US) usage. But they also have a free add-on international plan called "Global 100" that gives you 100 free international minutes when using their app (coverage includes Mexico, UK, Canada, India, and over 50 other countries, including Germany and Belgium) or you can pay $4.99/mo for 300 international voice minutes. You may want to do a bit more searching to see if anyone has posted their actual experience using the FreedomPop Global sim in Germany and Belgium for Uber. Steve: Thanks for the prompt reply. I did not know about the Global 100 and hope that will actually work, but again will require the app installation, which I will indeed get when the sim arrives. Next question, when you send me a friend request and I accept, will I get the 50mb from having you as a friend? Or do I need to have your (or one of the many addresses from SD site) in order to start building up my 500mb? Hi Larry, I sent you a couple of FreedomPop friend requests (using the email address on your comment). You can log into your FreedomPop account and accept my friend requests. You'll get 50mb every month for each friend you have (up to 500mb). If you want to get some additional "friends", you can get email addresses from the end of the SD thread and send them friend invite requests from your account. Hello again Steve, I finally installed my global FreedomPop Sim. Before I could send out a "test" email, an email came in. My phone app also appears connected so I assume the SIM is working. A few days of use will determine its worth. I did as you suggested and logged in online and copied the list of email addresses with the intent of boosting my data allotment. Several people "accepted" the "friend request" and I now have the max allowance and likewise, I assume this helps them out as well. However, in as much as I do not know any of these people and am not seeking any real - world friendships through FreedomPop, I have already received a text from somebody which I can see listed online when I log into my account. Right now, I have no idea what the text says and I assume that I have to install the FreedomPop App to see it. Is this correct? I've also received several requests to share data to others but in as much as this is currently my ONLY SIM and I depend on all the data that I can get, I really can't oblige anyone at this time. Should I feel guilty? And in as much as I'd like to make some requests to others for extra data myself, I don't feel comfortable doing so and I won't. Since you've been at this for quite a while now, and I presume you have added "friends" for the max data allowance, do you ever find yourself being harassed? And if this were to ever occur, is there a way to "unfriend" a FreedomPop friend or should I fear that I might lose some data allotment because somebody on my list might "unfriend" me? And if I install the FreedomPop App, do I have to be concerned that somebody on my list of "friends" could see my assigned FreedomPop phone number and start texting or calling me? I think it would be handy to try out the free calls and minutes through the FreedomPop app just so that I CAN save on data if I start to run low but looking at the FreedomPop apps in the Play Store, I don't know which one to install. They all have low ratings. And while I'm really curious to know who text me and why, I really don't want to get started with that. I know you've said that you don't use the FreedomPop app but if you have any advice or comment, I would appreciate because I'm not sure what I should do at this point. Hi Kim, when you get a FreedomPop friend, you get 50mb of data every month, and they get 50mb of data every month (both up to 500mb max of course). It's a win-win. You can share data if you want, but you do not have to, and you can ignore any requests to share. The only information your FreedomPop Friend can see is the "name" and "email address" that you use on your account, so you may not want to use your primary email address if you are becoming friends with people you don't know, though I've never had any issues. Your "friends" can not see your FreedomPop phone number. If you got any texts, they are probably wrong numbers. I think I saw a few random texts on one of my FreedomPop numbers, but never checked. You are correct that the only way to read a text is to install and use the FreedomPop app (for Android, you want the FreedomPop app called "FreedomPop Messaging Phone/SIM"). I have actually installed and used it to see how it works, and it works fairly well. I got a few FreedomPop Friends via slickdeals in the beginning, but now I get them from people who comment here and I also have multiple accounts that are friends of each other. I don't think you can "unfriend" someone, but if their account is cancelled, you won't get the 50mb bonus, which is why you should have a few more than 10 friends. As for checking your data usage, the only way I know to do it is by logging into your account on freedompop .com or by using the FreedomPop account app on your phone. By the way, I just sent you (shared) 100mb. I put 2nd card just like you described but cannot receive calls nor texts on the 2nd card. Internet however works on 2nd card. Other problem FreedomPOP numbers cannot be used to acquire GV number. P.S. Looks like their app is not designed for two sims. When you added 2nd sim did you see 2nd number in the app? Hi Philip, If you're talking about the BLU R1 HD with two sim slots, one can be used for data while the other is used for 2G talk and text only (with a traditional cellular phone number sim, which FreedomPop is not). The FreedomPop GSM sims are essentially a data sim, and the FreedomPop app allows you to use the Freedompop voip (virtual) phone number assigned to the sim. 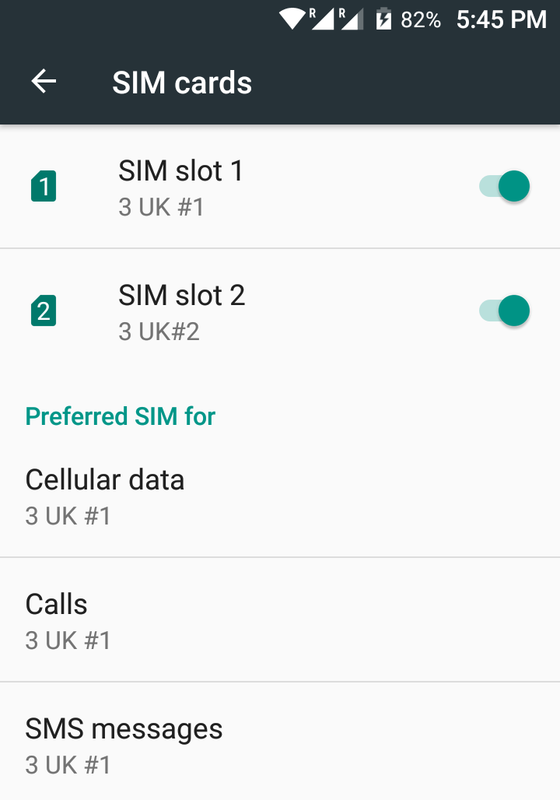 I tested putting two FreedomPop Global sims in the two slots, and was able to use the data on one or the other, but not both at the same time. I didn't test the FreedomPop talk/text app at that time. But I would assume it would only work for whichever sim was assigned to be the "data" sim, and not the other sim. I think you are correct that it won't work for two numbers at the same time, but just whatever number is assigned to the FreedomPop sim being used. Hope that makes sense. Also, I did use a FreedomPop phone number to set up a new Google Voice number just two days ago. I'm working on a new review on how to set up a new Google Voice number on Hangouts. I've seen some people say you can't use a FreedomPop number to set up a Google Voice number, and others say you can use a FreedomPop sim to set up a Google Voice number. Well, I just set up a new Google Voice number with one of my FreedomPop Global sim numbers. I had to have the sim and the FreedomPop app installed and working so I could get the voice call from Google to enter the two digit verification number, and then I just verified it this morning by receiving the six digit verification text from Google. It worked for me. This is error I get in Google Voice: "There was an error with your request. Please try again." In my case GV verified FreedomPOP number without problem but did not let me to acquire new GV number from the list. Hi Philip, I searched Google for your request error message, and see that quite a few people have reported that same error message for a variety of reasons, so I don't know if it's because you're using the FreedomPop number or something else. Google does say that you can't use a voip number and you can't use a number that's been used before. I don't know how you can tell what has been done with the number in the past. Anyway, I have a new Google Voice number that I set up with a FreedomPop number. You might want to try again, or try a different FP sim number. Good luck, and thanks for commenting. Thanks Steve (Cranial Borborygmus). I'm in the UK and found your work excellent. FYI; The '3' network is used here and FPop 'Premium Voice' extra service (chargeable) uses their normal cell signal for outgoing (only) calls it would appear as WiFi and Mobile Data can both be turned off. I agree that many negative reviews are due to users not understanding the system etc and have fed this back to FPop. Keep up the good work and thanks again. Hi Henrik, Thanks for commenting. I do hope FreedomPop keeps expanding the list of countries where the Global sim will work. That would be great, but for now it's important to distinguish where the Global sim currently works, and where it may work in the future. I think FreedomPop has been talking about Mexico service for a little while now, but it hasn't happened yet and people are anxiously waiting. I do hope they are able to add the countries you listed this year. Hi, Steve, another great article. Great job! Just a comment on VPN. I usually listen to Tune-In Radio's CNN News station while commuting. As it turns out, this station is only available for a US IP. As such, with the global GSM, you get "This station is not available in your country" message. I have ended up using a VPN I have set up at home or public VPN servers that have US locations. This certainly works, but it may be more technically included to others who expect things to just work. For me, it's a bit inconvenient, but I am ok as a free data user. My son took the GSM sims to Germany last summer and they continuously worked fine. We may be able to test them in UK this summer. I know there are many negative FP reviews, but I have enjoyed FreedomPop for a long time. Hi Masa, Thanks for the info on using a VPN to get around restrictions when the Global sim doesn't allow certain US-websites. It's good to know it's an option, but you're also right that it is probably too technical for most people. Fortunately, FreedomPop has the new LTE GSM sim which provides domestic AT&T data and doesn't have any of these issues. Thanks also for reporting that your son used the Global sim in Germany last summer and it worked fine. Thanks for commenting! Hi Steve, great article, thanks for laying it all out. 2. If I order the FP global sim on Amazon ($10), will I get the same 2GB free trial and premium service trials upon activating it on the FP website? Thanks! Hi Jeph, As far as I know, the Global sim is available (not out of stock), but they may not have any current special offers on it at this time. FreedomPop is promoting its new LTE sim for $1.99. I don't know when FreedomPop will have more working special offers on the Global sim, but I'll post them here if they do. In the meantime, you can purchase the Global sim for $9.99 from FreedomPop with free shipping the last time I checked. To order, go to the FreedomPop online store. Find the "CATEGORY" list on the left side and click on "SIMS". You should see both the Global sim and the LTE sim. As for Amazon, I don't know anything about ordering the FreedomPop sim from Amazon or what the offer would include. I would just order straight from FreedomPop instead. Thanks for the great write up Steve! Can you please confirm that the bonus 50mb free data for each new "friend" is permanent and not just for one month? I.e. One wouldn't need to find 10 new friends each month to get 500mb bonus per month. Please send me a friend request so I can add one of your accounts as my first FreedomPop friend =) Thanks again! Hi Peter, Thanks for your question. Yes, the friends bonus is permanent. Once you have at least ten friends, you'll get the 500MB bonus every month. You don't need to get new friends every month. The only thing you would have to worry about is if any friends closed their accounts, which is why it's a good idea to get a couple extra friends just in case, though I've never had any friends leave. Thanks again for commenting. I just sent you a couple of friend invites. Thanks for the write up Steve! Can you please friend me? Thanks again! Hi Ken, Thanks for commenting. I sent you a couple of friend invites. Hi Nima, Thanks for your feedback. I sent you a couple of friend invites. It appears the FreedomPop *Global* SIM is no longer available, although the AT&T/LTE SIM still is. Do you have any idea whether this is a temporary out-of-stock situation or whether they are discontinuing it? I travel to Europe for a week or two every couple months and the Global SIM seems like a great option for basic connectivity without having to re-up my German prepaid account every time I go. Hi Dan, I think all of the "special offers" (i.e. 99 cents) for the GLOBAL sim are currently "sold out" and FreedomPop is substituting LTE sim special offers for them instead. I don't know when there might be a new working special offer for the Global sim, but you can order the GLOBAL sim on the FreedomPop website for $9.99. I just checked and it shows it is in stock and available to ship. To order, go to the FreedomPop online store. Find the "CATEGORY" list on the left side and click on "SIMS". You should see both the Global sim and the LTE sim. Aha, thanks! The way that FP presents different offerings depending on the links used to access their shop is… quite confusing. Thank you so much for the in-depth review! I confirm that in Hungary the Global SIM card does not work, tested it in 11/16 and 1/17-2/17. It appears the Global SIM card is no longer available for purchase. Hi Sylvi, Thanks for reporting that the Global sim still does not work in Hungary. I just checked and the Global sim is still available, but only if you go through the FreedomPop online store and buy the sim for $9.99, per my other reply above. Unfortunately, there don't appear to be any better current special offers on the Global sim right now. Hi Steve, Really impressive that you put this effort and time in making possible for us to use the service free and even more, not losing time with finding out the bits and pieces and super small letters you would normally put no attention to. In one word: AMAZING, you did an amazing job also documenting this!!! Hi Herman, Thank you for your comment and feedback. I appreciate it. If you are ordering a new Global sim kit, when you downgrade the plan and service, please make sure you read the update on my FreedomPop LTE sim review about the ongoing "service downgrade bug" so that you can make sure you actually remove the Premium Plus service trial and you don't get a surprise charge for $7.99. If you do get charged, you can contact FreedomPop and get a refund, but it's easier to fix the bug and remove the service. Thanks again for commenting! Great article, Steve! Thank you for reviewing this. I recently got back from Italy (6/5-6/17) and used the global sim with the WhatsApp plan the entire time I was there. It worked great and saved me nearly $200! I probably would have never known about it if I hadn't come across your website. Thanks so much! Hi Seth, Thank you for the feedback and follow-up! It's great to hear that the FreedomPop Global sim worked well for you in Italy. By the way, I've been to Italy too. It is a great country to visit! I'd love to go back some day. Hey Steve, I can now confirm that the FreedomPop GSM Global SIM gives me adequate data connection in London. However, before it would connect, I had to change the APN to "three.co.uk" so the freedompop.foggmobile that we use in California wouldn't connect for me here. It appears to be connected as 3G which is fine. [update] I tried using the foggmobile apn again the next day and now it works! So both APNs are working. 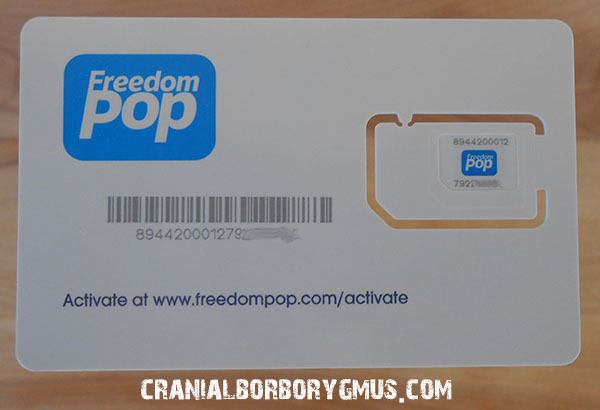 I've been using these FreedomPop SIM's for almost a year now, and I have a few additions to mention. - There actually are two versions of the Global SIM: (1) Talk, Text, and Data, and (2) Data only. Both SIM's can be used in data-only devices, but the FreedomPop Messaging App won't work with the data-only SIM. There also are some price differences in data plan tiers and pricing and the services options with the data-only SIM vs. Talk, Text, and Data. FreedomPop cannot convert the account associated with the SIM between the two types. - Be aware that if you use the FreedomPop Messaging App and run out of minutes or texts, all three services (talk, text, and data!) are suspended for the remainder of the billing cycle unless you purchase a plan upgrade. - You can actually use the Global SIM in a Sprint-branded LTE phone rather than BYOD the device onto FreedomPop's regular Sprint service, provided the SIM slot in the phone is unlocked for at least international usage. You don't have to pay the FreedomPop device activation fee (normally $19.99) that way. However, you will only get 3G (HSPA/HSPA+) service (no LTE) when using the SIM, and your free data is smaller (200MB vs. 500MB). Note, if you instead BYOD your Sprint device to FreedomPop, it also can be difficult to later get the device deactivated and removed from the service, since FreedomPop no longer offers even Email support for "free" accounts, and there is still no user interface on the website to do this! - With Freedom Friends, in addition to the free additional 500MB each month, those friends can each also give you 100MB/month out of their allowances, allowing you to receive up to 500MB additional (1.2GB total) each month. However, unless you closely control the other account, it can be difficult to get that data gifted to you reliably, particularly because FreedomPop doesn't Email notify the other user of your request. - FreedomPop never truly disables accounts! Even if the SIM or device is removed and deactivated, the account still goes through monthly billing cycles on free plan and can still give away data! You will always get the extra 50MB per friend, even if the other user has ported out their phone number and stopped using FreedomPop. - FreedomPop talk and text phone services are actually classified as landline VOIP carrier service, not a mobile phone! Porting out your number will not terminate your service, just the phone number will disappear from the account until you choose a new one. Data service will continue unaffected. BTW - porting out from FreedomPop will also take several days to complete for the same reason, as landline number is ports are not required to be completed in 24 hours like mobile number ports are! - FreedomPop SIM's are an excellent decision to use in tablets with cellular support, and also hotspot devices (such as T-Mobile 4G HSPA+ Mobile Hotspot device, if you can get the SIM slot unlocked). However, be aware that since the IP address of the Global SIM is usually UK-based, some services not intended for use by people who are located outside the U.S. are normally blocked and won't work. Examples include Apple's App Store, Pandora, Netflix, etc. - I've tried FreedomPop's Multimedia (MMS) and Group Messaging service to be very problematic! While incoming MMS messages generally work, outgoing are formatted differently than by a true mobile phone, and I've seen the stock messaging app. on the receiver's mobile phone show blank attachment or even crash when they try to open. Not recommended! - FreedomPop Messaging App doesn't supported SMS shortcode messaging reliably either! - If you add a second SIM or device into your order for $.01, one problem is that it will be added as a secondary device on the same account. This means you can't use Freedom Friends or share data on this second line. With phones and hotspots, if you can access the support team, it is possible for them to deactivate/release the device do it can be reactivated on a different account, but I'm not sure if that's possible with SIM cards. - If you have more than one FreedomPop SIM or device and use them for phone services, it is possible for customer service to transfer or swap phone numbers between the lines instantly. - You can now buy FreedomPop SIM cards and other devices at BestBuy too. - Only the Global SIM offers the Whatsapp Unlimited plans as far as I know. In fact, there even exists a little known free Basic Whatsapp Unlimited plan, but to switch into it you have to find the secret link to in the FreedomPop forums! Nobody else offers this service, at any price! - Overall, the Global SIM is a one-of-a-kind product (free international data roaming) that can't be bought elsewhere except through AT&T/T-Mobile/Sprint/Verizon carrier post-paid plans, at ridiculous rates! Hi Chris, Wow! Thank you for your EPIC comment! Much of what you say is in my global sim review above (or my more updated LTE sim review), but you've summarized it nicely, and you've also included some new stuff. Your comment could really be a stand-alone review! I am using all types of FP services: Global SIM, US LTE SIM, BYOD, FP sold phone, FP hotspot, and OTT Free Calling & Text App (no data service account). Sprint phones with the DSU unlock (newer devices only) can use the US LTE SIM, otherwise with just the ISU unlock you must use the Global SIM, or BYOD. I'm using Global SIM with an older ISU unlocked phone. The unlocked T-Mobile 4G Mobile Hotspot is also only going to work with Global SIM, and only within the US, due to the fact it only supports the AWS band and can't get AT&T service or foreign carrier service. It's pretty cheap as a result since it is non-LTE and only good to use within the U.S. on T-Mobile service, and T-Mobile itself claims (falsely) that it cannot be SIM unlocked. Unlocked, it's a perfect fit for the Global SIM use, and it works with the Talk, Text, and Data SIM even if you don't pay FP for tethering service. I already recall a few of my missing points, such as Premium Voice service only available on Android Sprint devices (not global or lte SIMs), free 100 International Calling minutes each month to selected countries (some including mobile phones!) if you just sign-up for the Global Calling plan, with multiple SIMs on hand you can easily swap them if you run out of data (if you don't use FP Messaging App, which ties your phone number to the SIM), and international numbers available in select countries for your account for nominal fee. P.S. All my US LTE SIM lines got suspended recently with the website displaying the message, "Your device is asleep due to non-use, click here to re-activate, but when you click it just hangs with a spinning circle. This is despite even recent use! Lots of people affected by this new policy. The fix to re-activate is to login via the new http://my.freedompop.com/ site instead where the button works correctly instead of the older http://www.freedompop.com/. Wish they'd fix that! Hi Steve, I have not used Global SIM overseas, but you can be sure I'd bring them with me if I go there! And likely with one of them using the WhatsApp Basic 100 min/100 text/200 MB plan. The Global SIM was a godsend for me when I discovered what it really was, and I'd never totally get rid of them, as having a service-active foreign SIM sitting around is quite unheard of, and very useful to at least to test that your phone is properly unlocked and ready for foreign travel before you go. When the US LTE SIM came out, I did "upgrade" the iPads and iPhone 3GS to use them instead since the foreign IP has been a problem, plus my "newest" iPad has LTE support that I couldn't use with the Global SIM. However, the unlocked T-Mobile 4G Mobile Hotspot (which only supports the T-Mobile-only AWS bands) and the international unlocked Sprint HTC One M8 continue using the Global SIM, since the US LTE SIM won't work in those devices. Like you said, for general use only in the U.S., the AT&T US LTE SIM is a better choice, unless there is a reason your device can't use it, which as I described above is the case with two of my devices. Hi Steve, After nearly a month, my GSM Global SIM continues to work fine for a data connection here in the UK. However, that SIM was without a connection for the past three days no matter where I went or what I did. Today I finally took the back off the phone, removed the SIM and reseated it back in the slot, and voi-la! Instant connection again. I wish I knew what made these things "tick". Every once in a while they seem to need to be "spoon-fed". I do agree that the AT&T LTE SIM is the way to go when you're in the States. But when you're not, the GSM Global SIM is an awesome alternative, if you don't mind using VOIP apps, it equates to free mobile phone service and I have to say, after eight months of using the FreedomPop SIM's, I'd never go back to paying a monthly fee with a major carrier again. "FreedomPop is moving to its newer faster LTE network. In order to ensure you get up to 5x your current speeds, and ensure ongoing reliability, we urge you to upgrade your old SIM now. Get a free upgraded SIM and new line today." Do you think it's a good idea to take this offer? Hi Jain, I have 5 global sims and 4 LTE sims. I only use the LTE sims now because I think they work better. I don't know why FP sent this email, and I haven't gotten it. But I do think the LTE sim provides better coverage. I'm also guessing that although they say you can get a "free" sim, there will be a 99 cent "activation" charge. In other words, it's just the regular $0.99 LTE sim offer. I'm not sure what's going to happen with the Global sim, but I do think the LTE sim works better for use here in the US. I have read that T-Mobile is converting some 3G towers to 4G/LTE in certain areas (like here in Santa Barbara, CA), so it could be that the Global sim won't be able to roam on T-Mobile anymore in those areas. If you do order an LTE sim, I'd recommend that you set it up under a new account (new email address) so you can share data. Also, make sure you downgrade the plan, and service if you need to (make sure it really downgrades by checking your account overview page). Thank you Steve! I really appreciate all you have done. I have benefited greatly from the knowledge you shared with the public. I guess I'll pass this offer, since I already have a couple of LTE sim cards. I thought FreedomPop was offering me an upgraded global GSM card with higher speed, which would be worthwhile. I picked up 2 SIM cards prior to going to Europe in September (2017). Here are some of my findings. Our first stop was in Bergen, Norway. Popping in the SIM Cards into an unlocked Samsung S7 and Amazon Fire phone I picked up a signal indicating I was connected to Freedompop. After entering the correct APN details as per various website guides, selecting roaming on, setting to 3G/2G autoconnect I was able to demonstrate I was connected to data in the Freedompop messaging app yet using any data intensive apps I was unable to obtain any data. Reading various online forums I tried multiple solutions including firing off a message to technical support which promised a response within 48hours. Because we were about to get on a cruise I ended up picking a local SIM card with data for backup. I also ended up subscribing to VIP service ($6/month prorated). Tech support basically advised me to do the same procedures that I had found online. After a few attempts, tech support admitted they had a problem with these cards and had to do something on their end and promised things would work after 24 hours. 24 hours later the SIM cards were still not working for data. Online you could see the usage patterns showing 1Mb being used every so often. Then suddenly we were at another port (Haugusund) and data suddenly worked on my Amazon Fire phone, the one with the SIM card I did not speak with tech support for. Telnor/Freedompop showed up as the connected carriers. This worked for only while we were in this port and both SIM failed to work at the next port. While cruising towards Germany, I started having data again when we came close to Danish cellphone towers. In Germany I found the cards worked reasonably well as long as you set phones to 3G only otherwise one would frequently drop to EDGE data which was useless. Also a general finding in Germany is that cellphone coverage for all users were pretty bad on train travel unless you are in a big town. I was also able to use these cards with no problems in Spain and London. One more thing I noted was my bonus data on signup (2GB and 1GB) +500 MB friend bonus was used last. ie: on the last day I had to downgrade my plan to the free plan I had maybe 300MB left. As soon as I downgraded, I was left with zero data left, not the 300MB I was expected. One should take this into consideration when downgrading. Hi Simon, Thank you for your excellent Europe trip report! Sounds like the Global sim was problematic in Norway, worked in Germany fairly well as long as you set the phone to 3G only so it wouldn't drop to 2G, and worked ok in Spain and London. Good to know, as well as your other points on dealing with FreedomPop support and what happens if you've already used a lot of data and you downgrade to the free plan (you end up with no data until the start of the next cycle). Thank you for taking the time to write all this. Excellent comment! Global SIM Activation: Today, November 14th, 2017 I activated a FreedomPop Global SIM that I got off ebay. Last night I tried to activate online but it did not work. I called today. When trying to do it online it asks you choose to not get the offered premier plan. Then it takes you to the next page which shows you have chosen the premier plan. Then you choose the free plan and click next and you are now at the Activation/Shopping Cart page. You need to again uncheck the premier plan there. There is also $10 you can uncheck so as not to have them take the $10 for overages. The charge for activation is thus 99cents. When doing it on the phone basically the same issues arise. Firmly, but nicely ask not to be put on the trial plan. Ask that no services be included. Thus I got the Global Plan already downgraded. And then I was offered a free [or was it one cent] LTE SIM. The man on the phone was quite insistent. I took it. It is set up with the trial plan and services. Can not wait to get that SIM. Also, with the online attempt and the phone call I needed to provide a email address that was not linked to a FreedomPop account. Finally, the Freedom Friends 50MB credits are getting credited to the LTE SIM and not the Global SIM. I know that next month both will have the credits. Hi Robert, Thank you for your detailed comment about activating a Global sim that you bought on ebay. I've always gotten my sims directly from FreedomPop, so they've always been pre-activated and I've never had to activate any of them, but I know you can't buy the Global sim directly from FreedomPop anymore. Based on your report, it sounds like online activation for the Global sim isn't working and you have to call. Good to know, and also good to know what to expect when if you can do it online and/or if you call in. I strongly prefer to do everything online, so I hope they get that fixed, though I don't know if they will for the Global sim since they aren't selling it anymore. You also mentioned that you got one of the new LTE sims. I think you will like it. That is what I use now, and at least for me, they work great. Thanks again for your comment and report. I already have 3 of the LTE SIMs, one data SIM and 1 LG phone. So it was not all new to me. I really did not need another LTE SIM and wish now I had not gotten it so that the Freedom Friends this month would have accrued to the global SIM. My main purpose in reporting was to indicate the global SIM can STILL be activated. I basically got it for curiosity purposes. My chances of going to Europe before it ceases to be useful is slim. I do have a 3UK prepaid SIM that seems to be a good value. For 20pounds you get 12gb of data [9 of the 12 can be used roaming.] In the next week or so I might stick it in a BLU R1 HD to play a little with data. Your review pages are the best thing on the internet produced in SB county! I have two global sims I received with fpop mifi2 devices. I am not using the mifi due to auto updating by phones over wifi using a lot of data. I put the global sim from the mifi in a phone and it does work with data. But no phone number. Do you think i can use Google Hangouts with this data only SIM from fpop? I have been happy with the global sim in phones. It saved my bacon when in Spain Lufthansa wouldn't allow me to checkin for a flight due to a ticket number problem with United. I used the global sim to call United (domestic call for global sim with number) to United and spent over 20 minutes with customer service getting new ticket numbers. Hi MT, Thanks for your comment and question. I would think that if the global sim from your mifi device is now in a phone and is working to provide data, you should be able to continue to use it for data, as long as it works. You've got a neat idea... I don't think I would have thought of it, but then I also only have sims and no FP devices. Yes, you can use the data for Hangouts with a google voice number. Bad News! Global SIM dying. People are reporting on Howard Forum that they have received an email from FreedomPop stating that the Global sim will stop working on Jan 3, 2018. Well. You will no longer need to update this page soon. Hi Robert, I've read other people reporting this same email as well. I haven't gotten the email for any of my Global sim accounts, but I'm assuming it is correct. We'll find out for sure in January. I've posted the update at the top of this review. Thanks for commenting! Has anyone updated their global data sim to the LTE sim via the 99?? offer on their account page? I am wondering if my current account settings will stay the same (free plan, 500MB friends data, auto update turned off with $5 credit), and there is no additional fee. Hi Allen, Good question. As far as I know and from what I've read, the "upgrade offer" is really just a link to order the new LTE sim, and I think it might also charge $6.99 shipping, or something like that. I'd recommend that you just order a new LTE sim via the Penny LTE Sim Sale link, and then you get free shipping. Note that now you have to pay $5 (or $10) to downgrade to the free plan, though you can also then disable auto-top-up for free. I cover this info in my new "FreedomPop for Dummies" guide. I think the credit requirement to downgrade to the free plan happens regardless of whether you use the "upgrade" link or just order a new sim. If you order a new sim, you can always contact FreedomPop via Twitter and ask them to transfer your FP number if you want, and/or you could also ask them to transfer credits. In any event, I'd just order a new LTE sim for a penny rather than use the "upgrade" link. And if you need to get new FP friends, check out my FreedomPop Friends list. FP Global Sim Extinction update: This statement was posted on the FreedomPop Forums by Miguel S, a FP admin, "Some older SIMs will no longer work as our network partner changes carrier settings. Not all SIMs are impacted, but if you've received notice via email - then your SIM is amongst those impacted and will cease to operate on January 3rd, 2018." Seems only some of the Global SIMs are endangered. Would help explain why only some people got the warning email. Hi Robert, Thanks for your update! I have not received any emails for any of my four Global sims, so I'll be curious to see if they still work on January 4. Just got back from a trip to Spain and the UK. SIM worked fine in both countries. I used it from 1/11 to 1/13 in Spain and 1/13 to 1/16 in the UK. I got the Global SIM last March (2017). Hi Tony, Thanks for your comment and repor.! It's great to hear that the Global sim is still working in Europe. That is awesome! My Global Sims still worked in the UK when I visited last month. Took multiple sims that I bought last year and was very pleased. Hi Joe, Thanks for your comment and report. I've seen other reports that the global sim is still working in various countries in Europe. I don't know how much longer it will work, but it's good to know that at least it still does for now. Thanks again for your report! Steve, My Global GSM SIM stopped working today. I noticed because Waze couldn't connect to the network. When I got to work my phone had a notification about my service. When I log in on the web I'm shown that my SIM has shipped. (Yeah, two years ago.) It doesn't have options such as displaying usage, so it acts like the SIM isn't activated. Please note that in the end of September, some older SIMs will no longer work. To avoid service interruption, we ask you to take advantage of our FREE SIM with faster speeds today. If you already ordered your LTE SIM, complete your mitigation [sic] today! I didn't complete my "mitigation" (LOL), so I guess they're no longer supporting their Global GSM SIMs. Strangely, on the phone when I tap the notification it offers to activate my SIM for $0.99. PS: It's people like you that make the web an awesome resource..
Hi Larry, Thanks for your comment and report! I've never gotten any emails, but I just checked my two Global sims, and they no longer work. I've added a "final" update to the top of this post. In November 2017 I activated a FreedomPop Global SIM that I got off ebay. A few months ago they started charging $4.99 a month. And now I got "the email" saying it will shut down 10/20/2018. We will see. But I also sent for an LTE SIM for free with FREE shipping. It looks like it might be finally dead. Hi Robert, Thanks for your comment and report. If FreedomPop is closing PAYING global sim accounts (like your account that is paying $4.99 per month), then it seems clear the Global sim service is finally ending. I closed my last two accounts earlier this month when they got deactivated and stopped working. Looks like any remaining Global sim accounts (free OR paid) will soon be deactivated as well. R.I.P. Global sim. 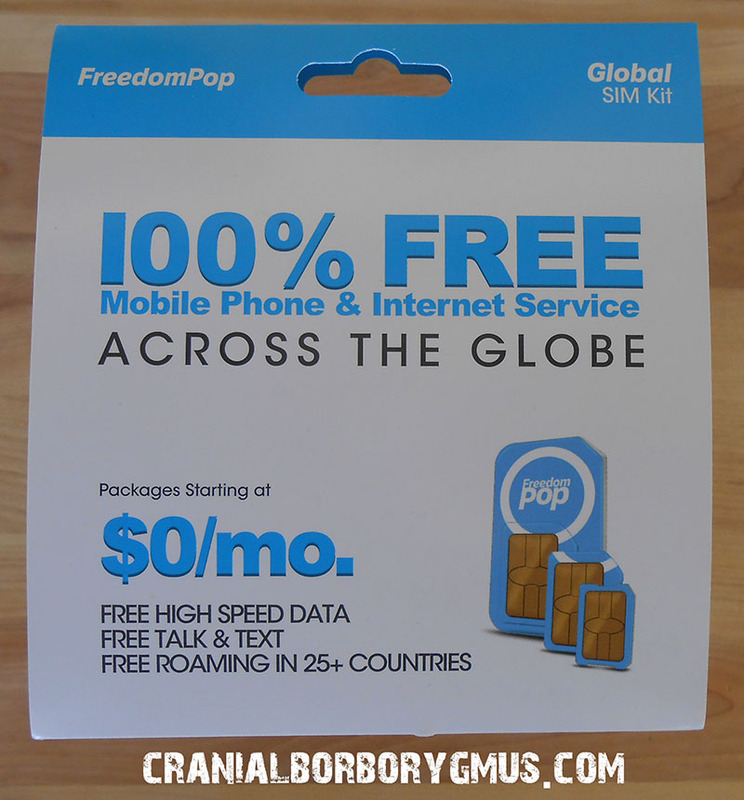 Do you have a comment or question about the new FreedomPop Global GSM sim kit? note: Your comment will not show up above until after I have reviewed it, which usually takes less than 24 hours.